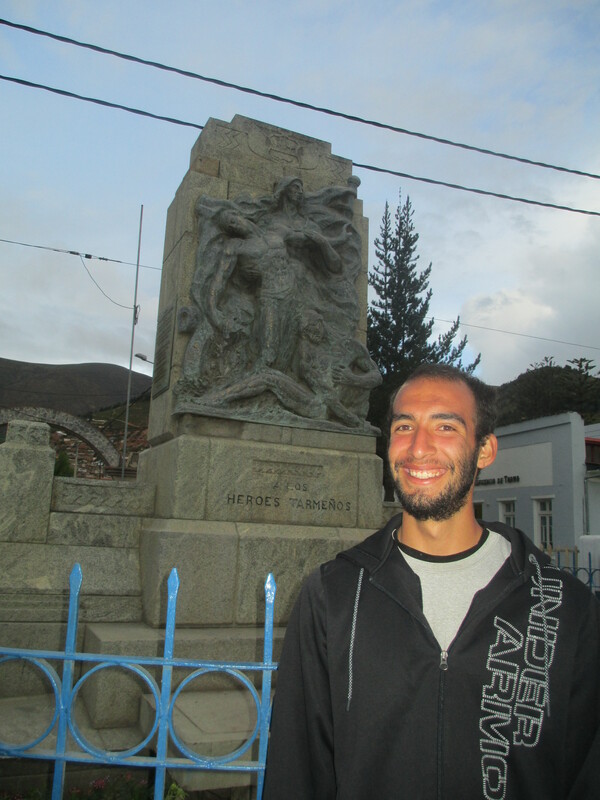 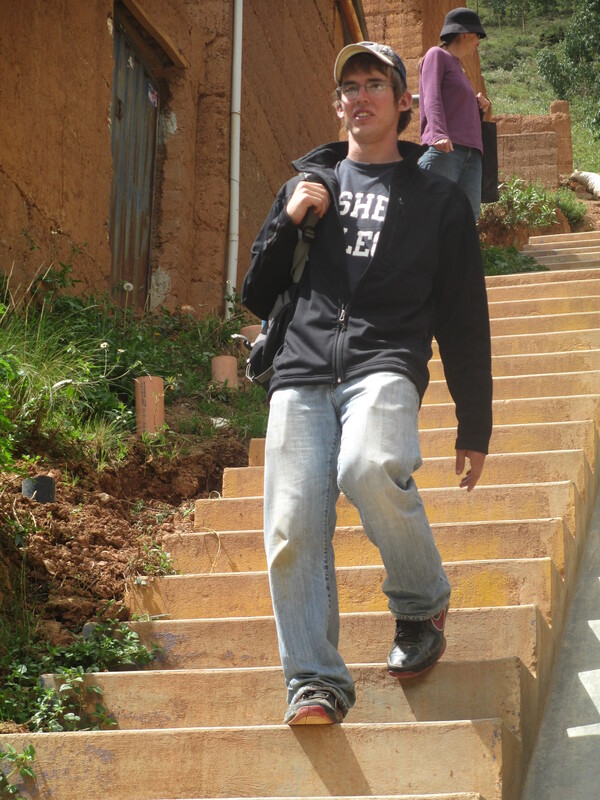 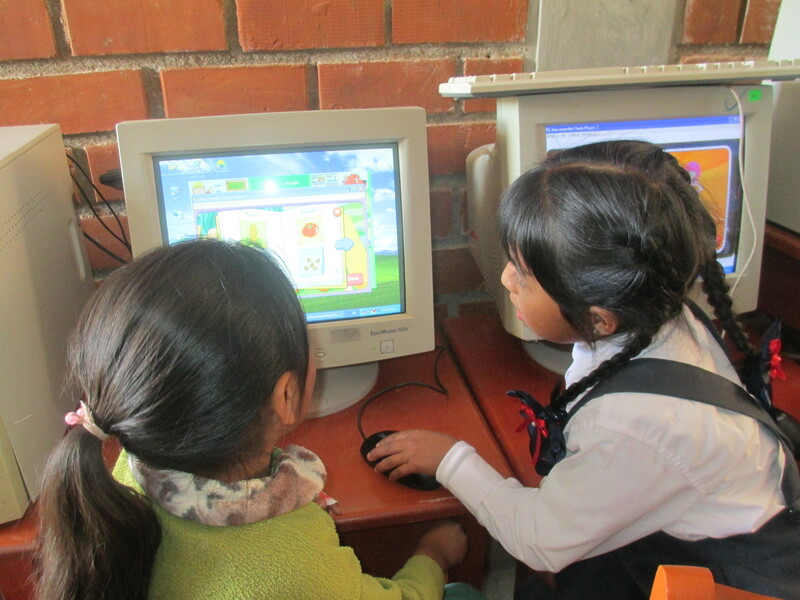 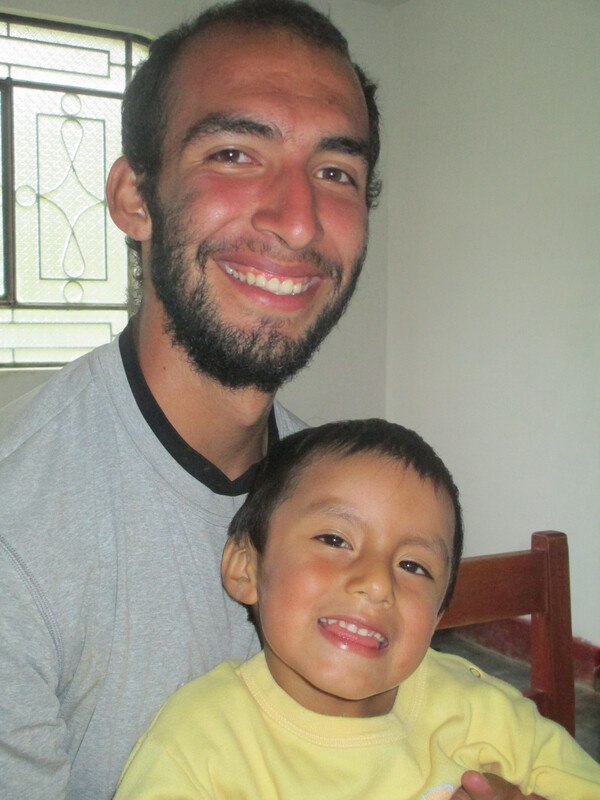 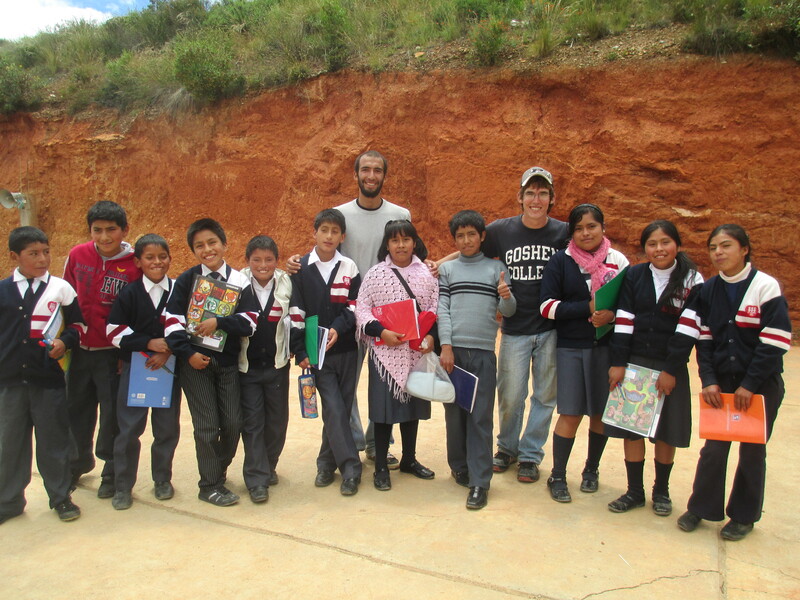 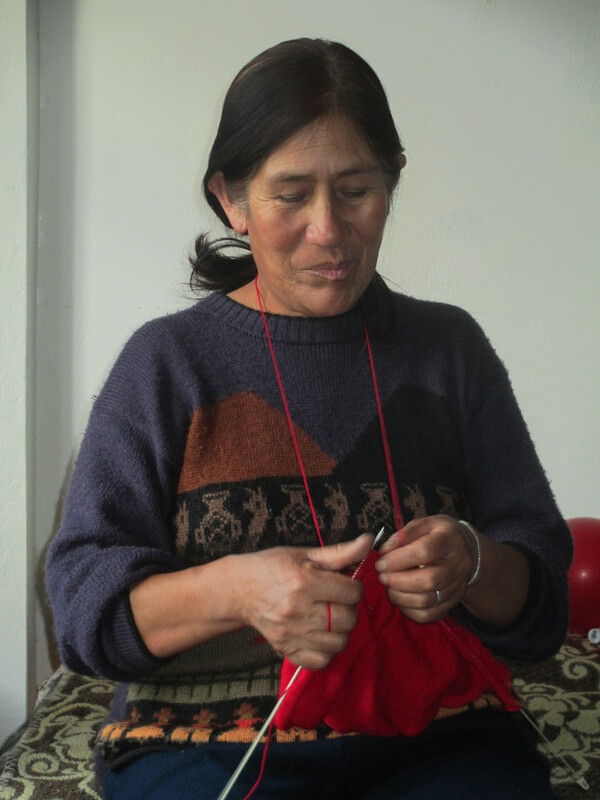 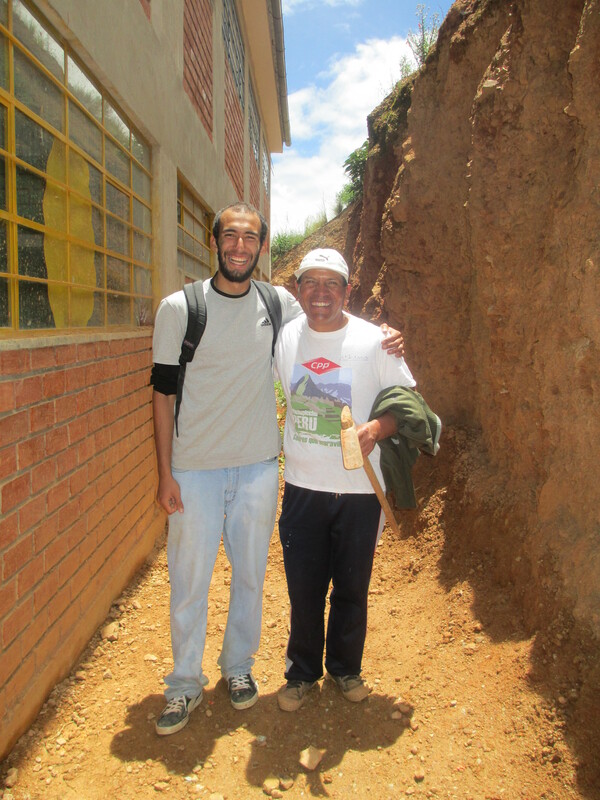 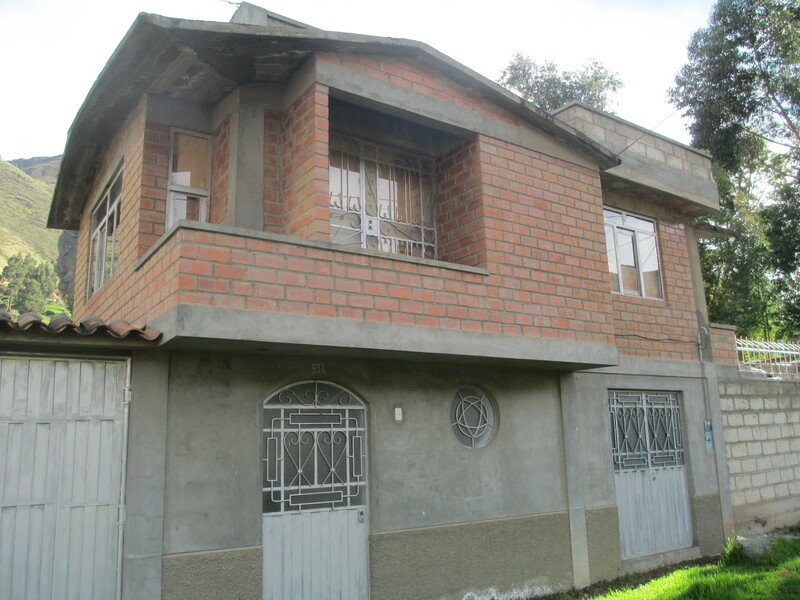 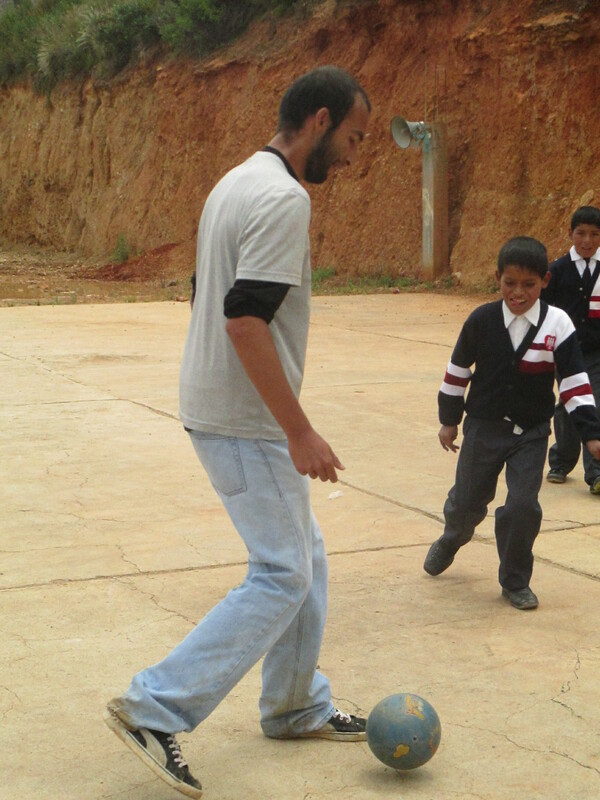 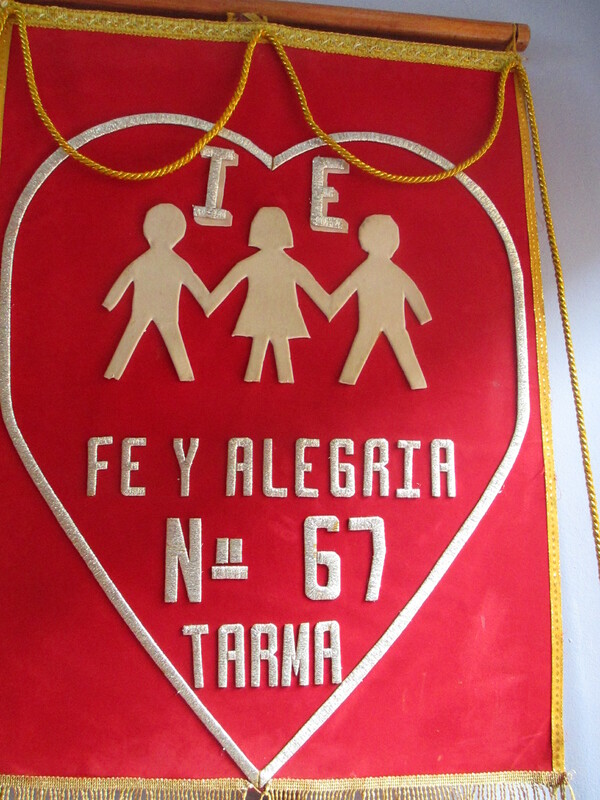 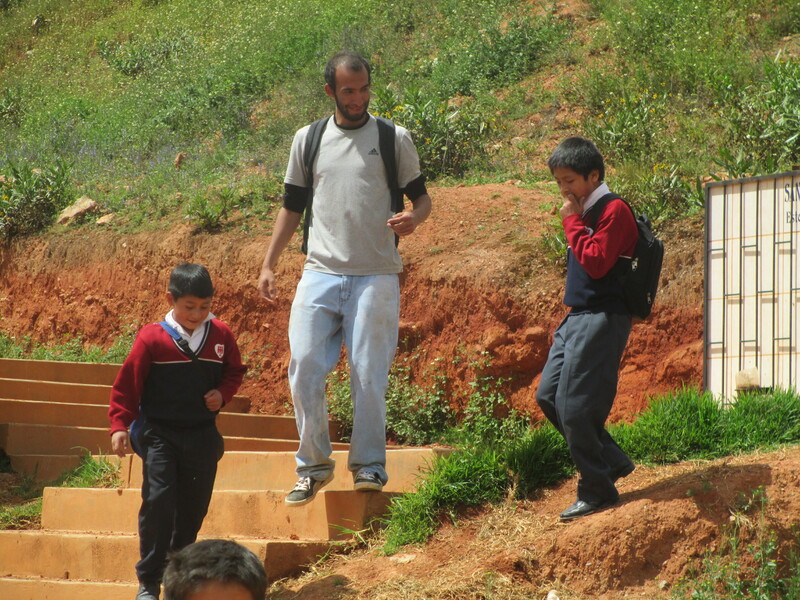 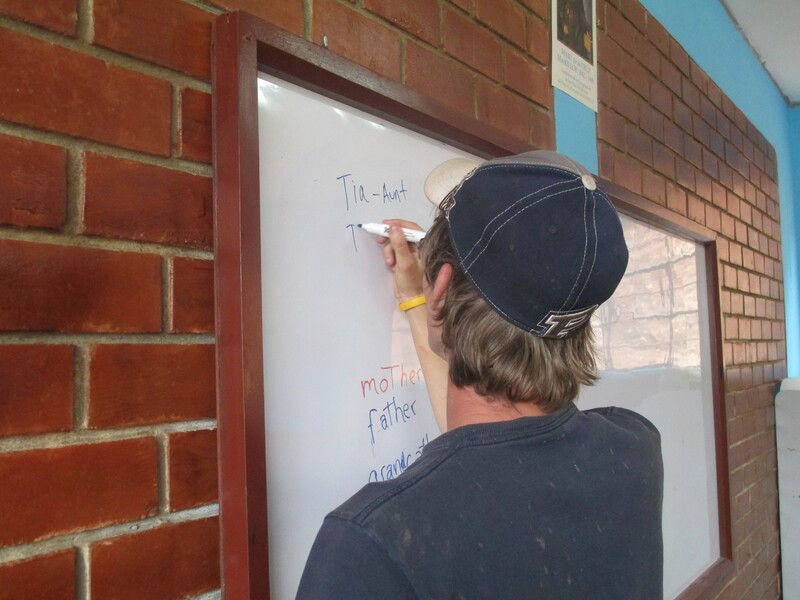 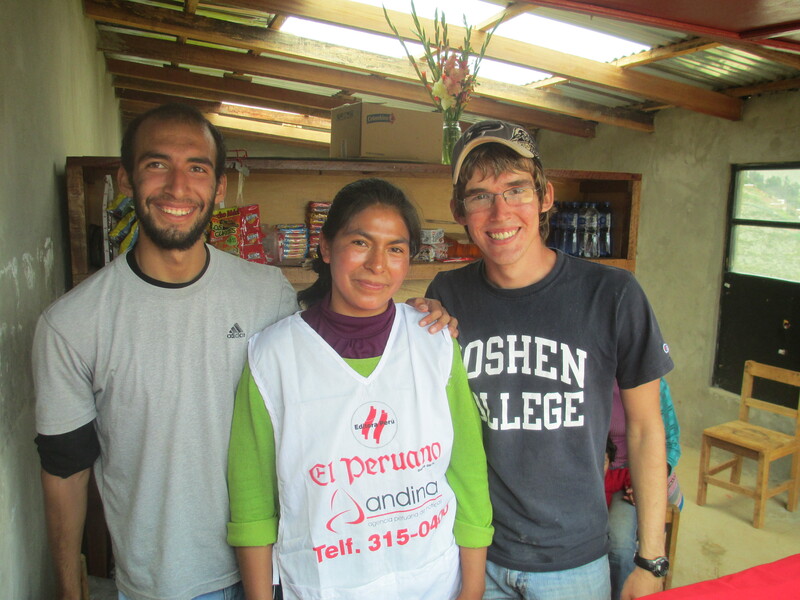 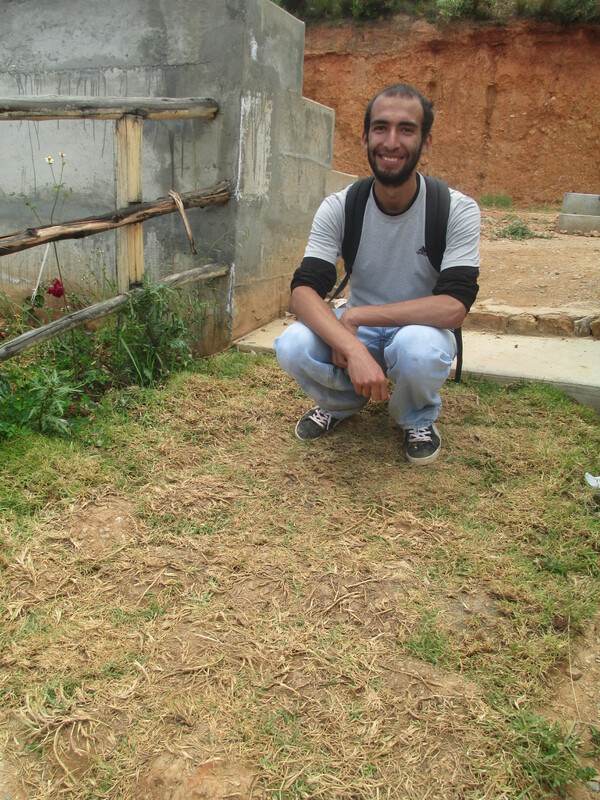 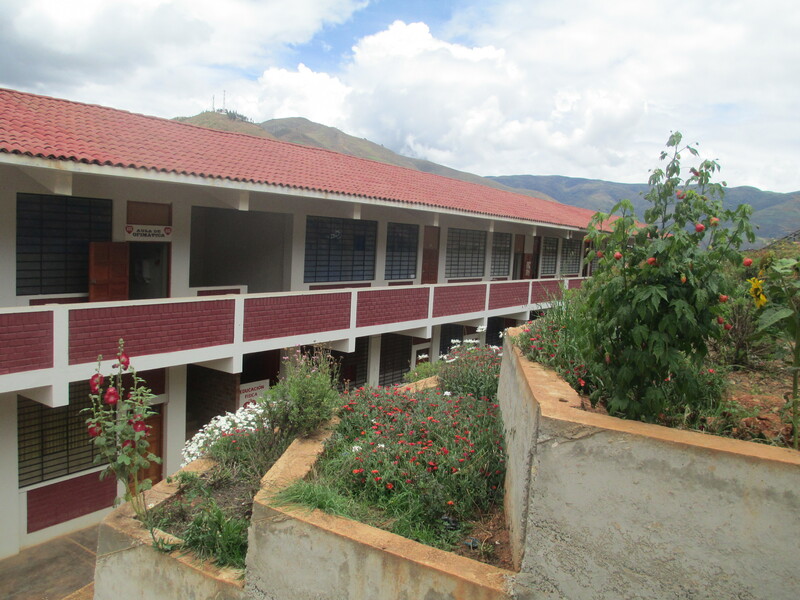 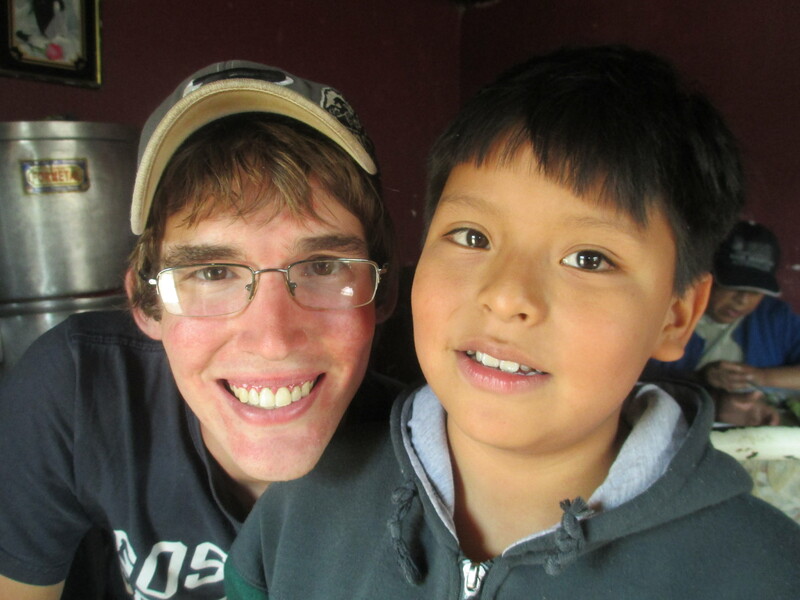 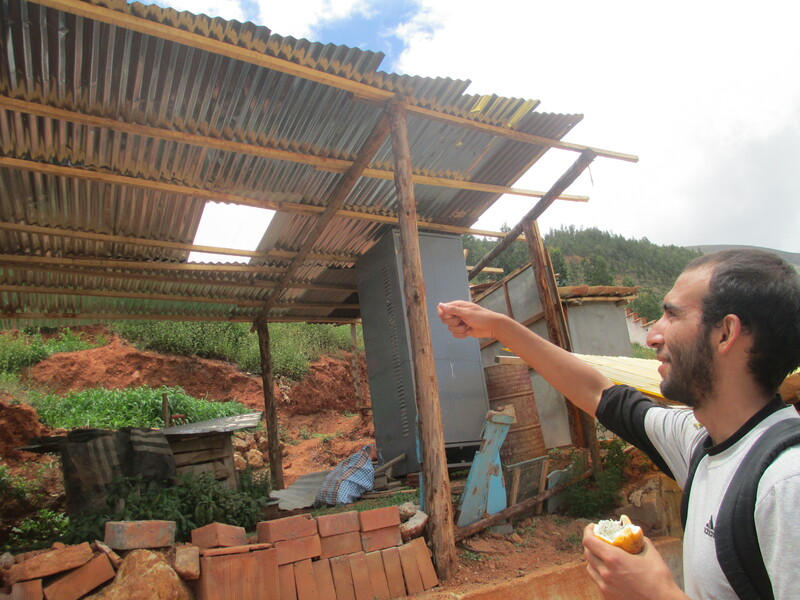 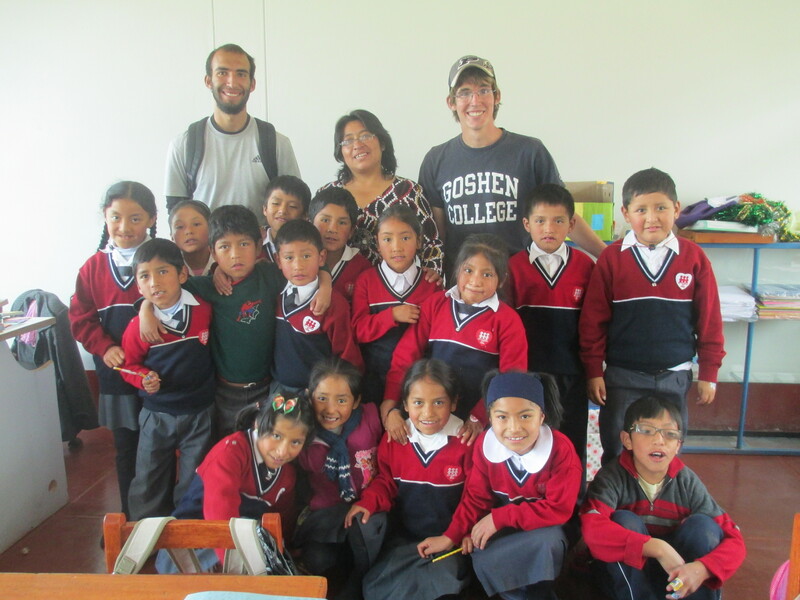 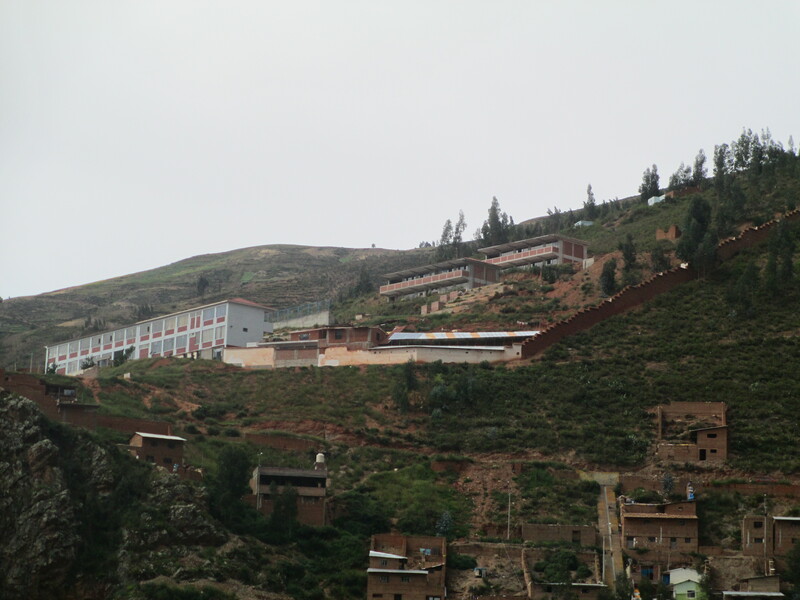 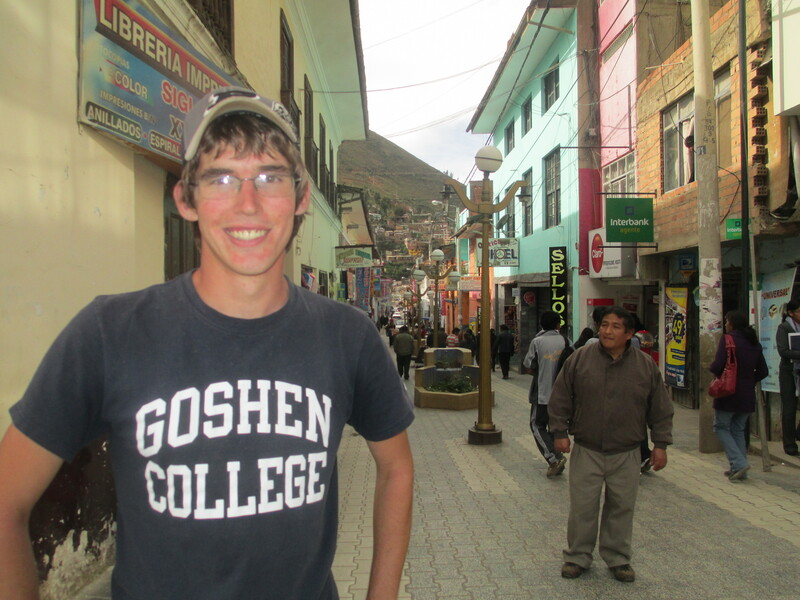 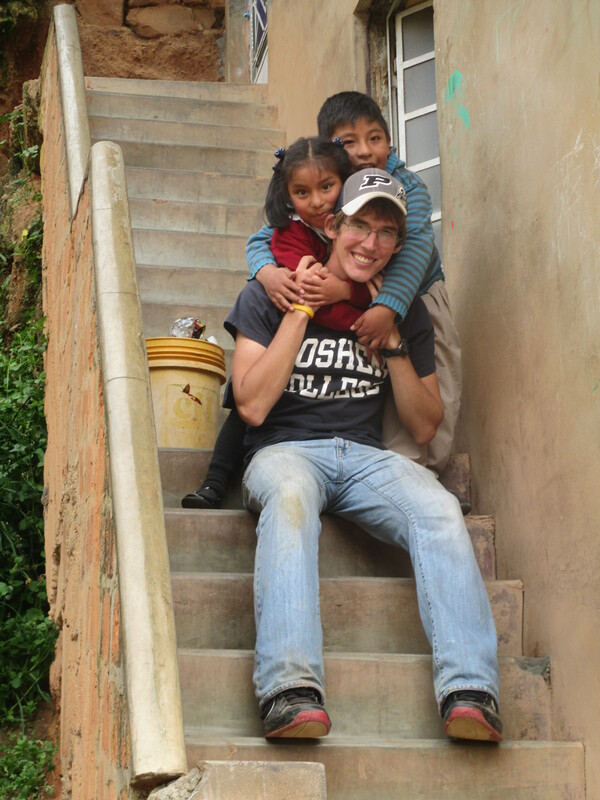 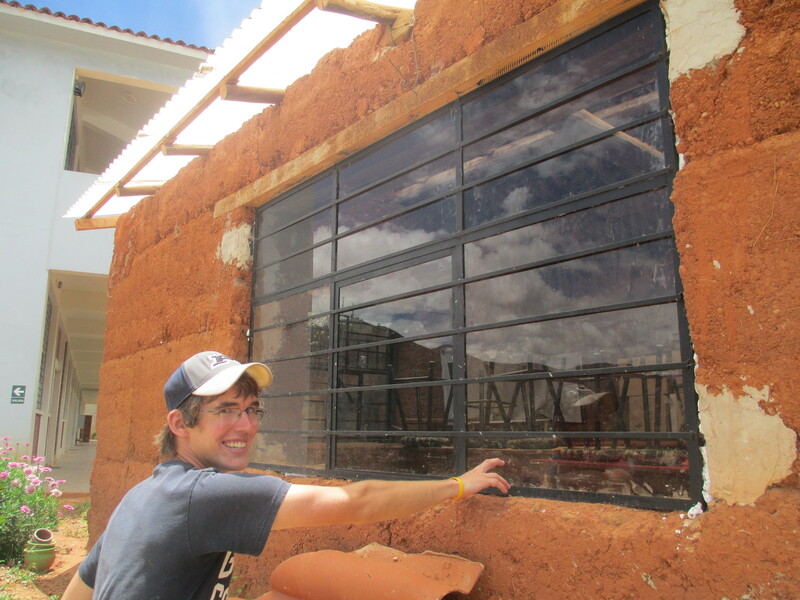 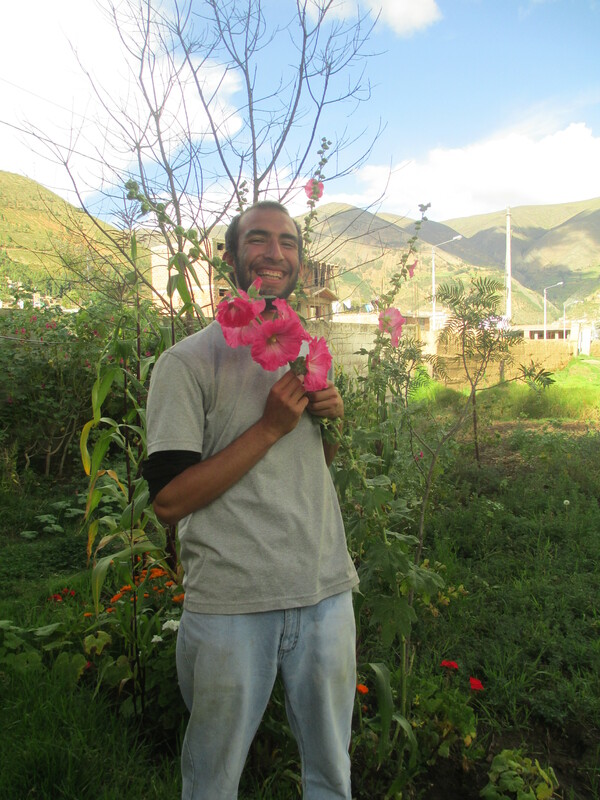 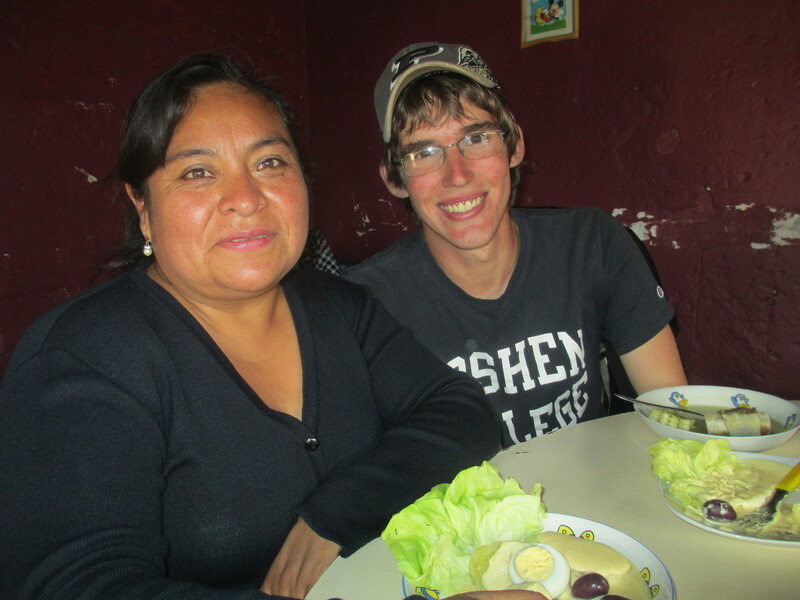 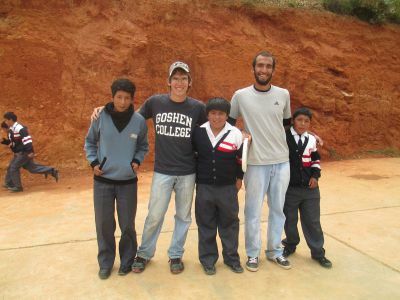 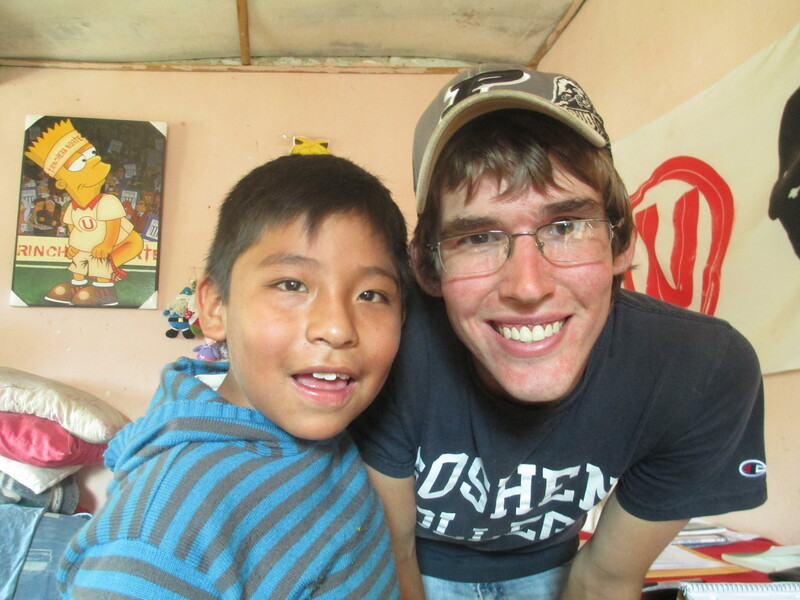 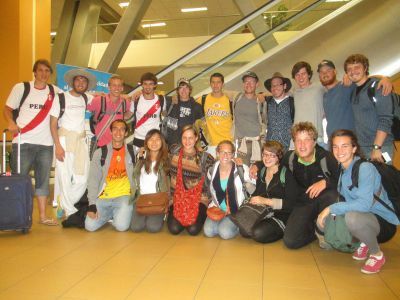 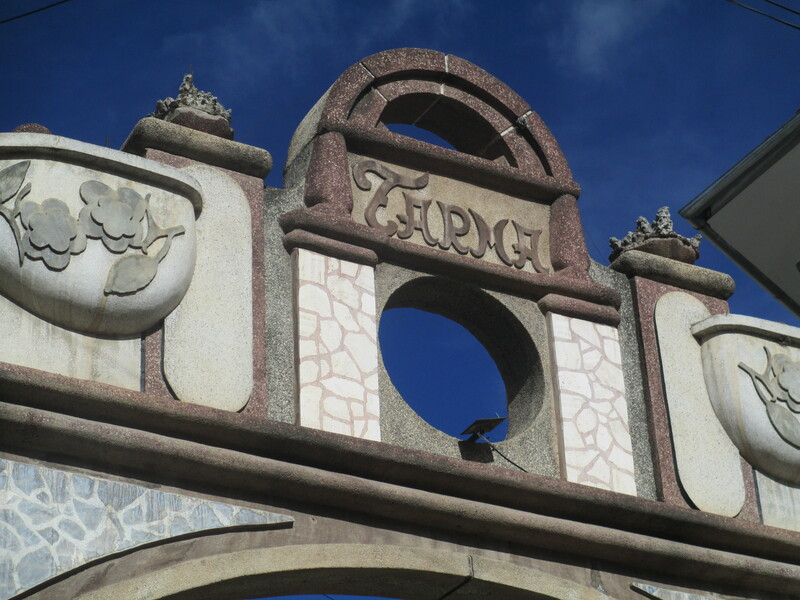 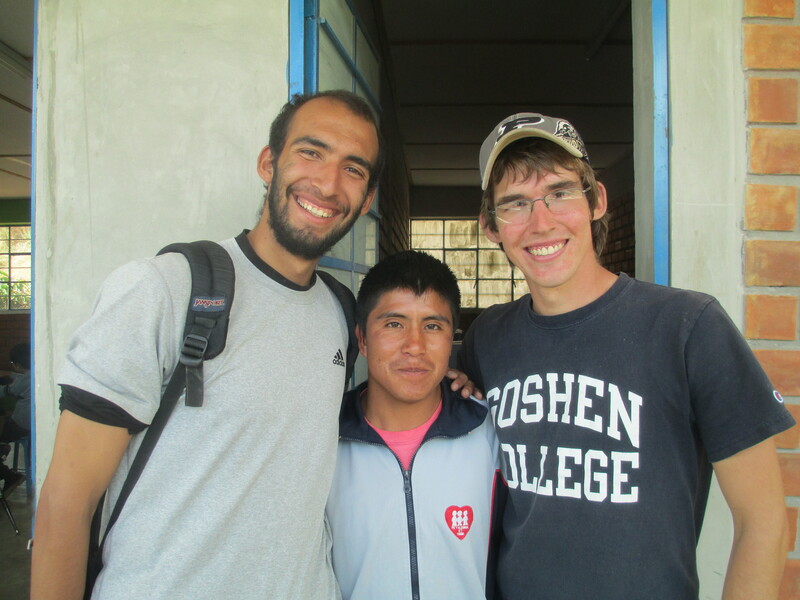 Andrew and Oscar are volunteering at Fe y Alegria (Faith and Happiness) School in Tarma. 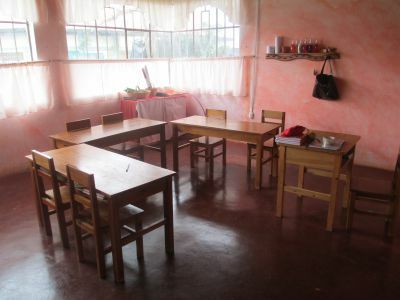 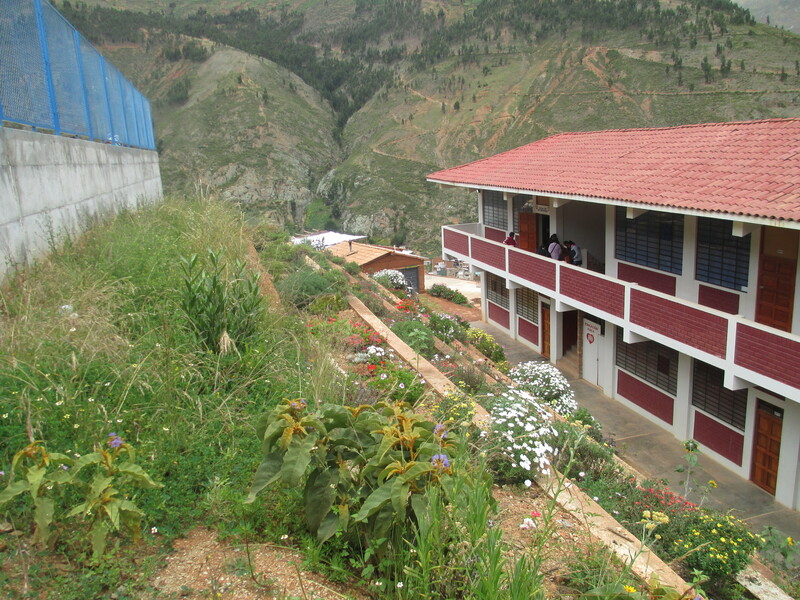 The school serves children living in extreme poverty. 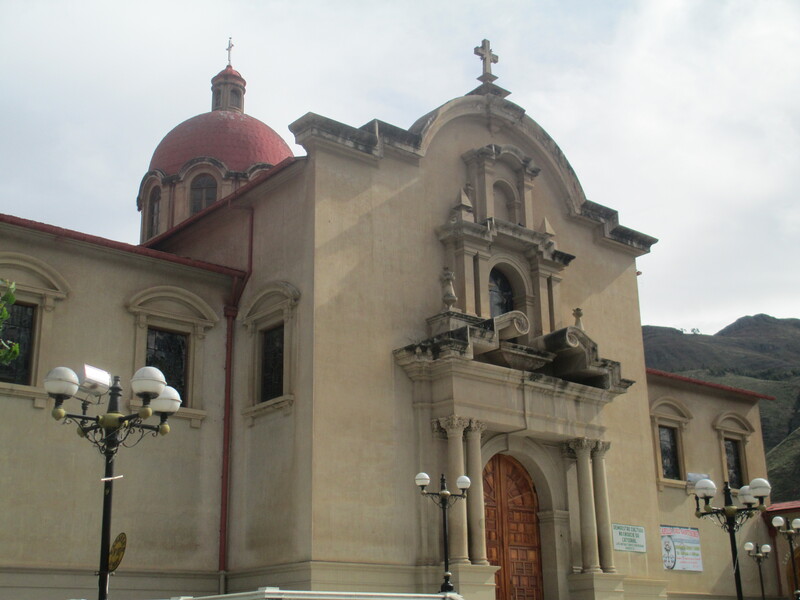 It was founded several years ago with help from the Jesuit order of the Catholic Church. 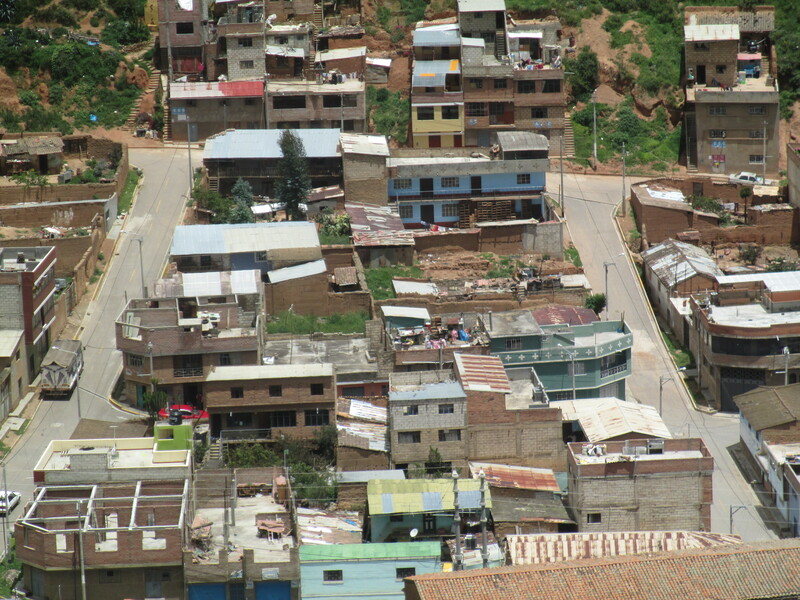 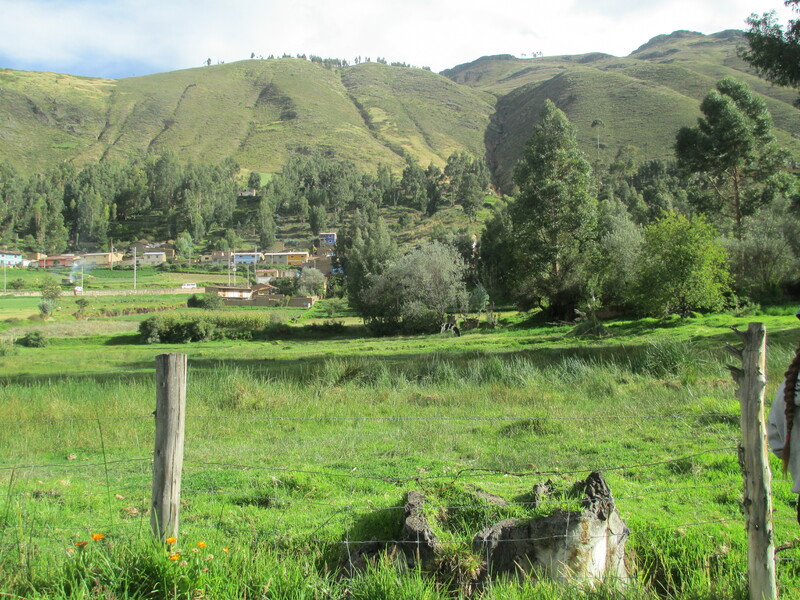 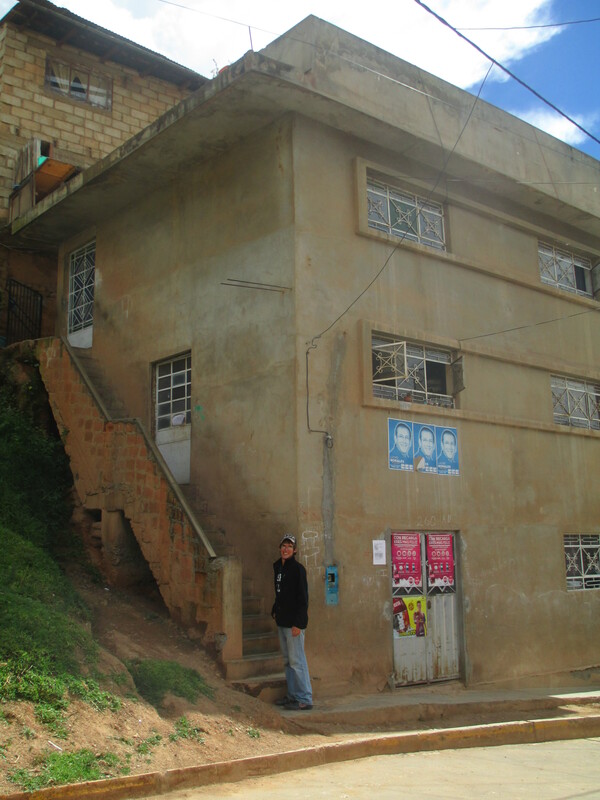 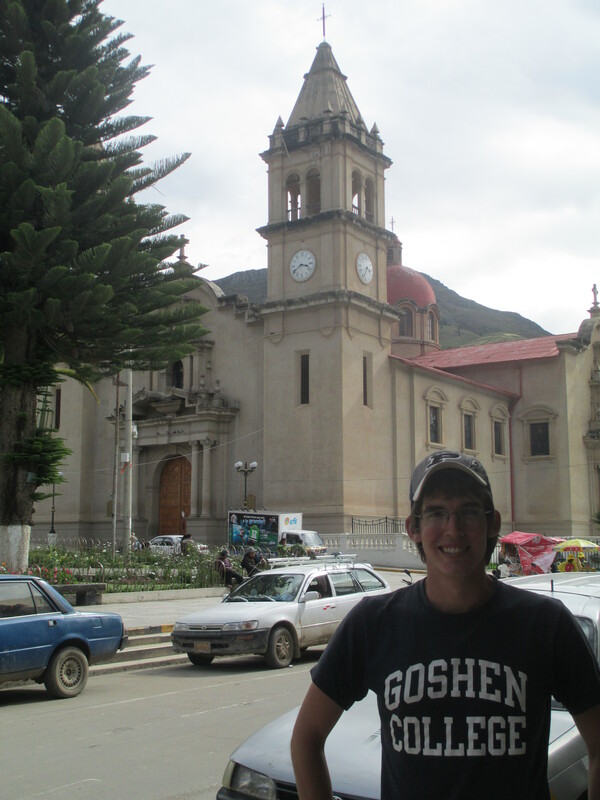 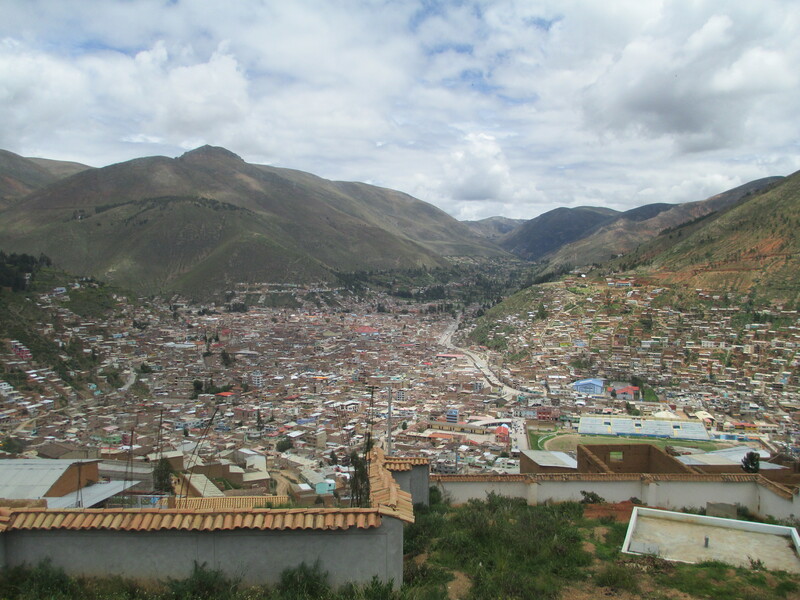 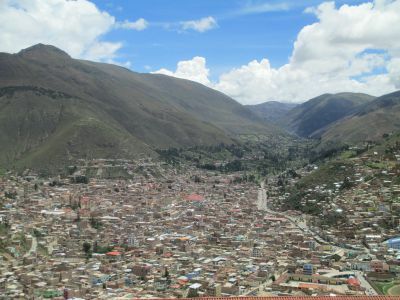 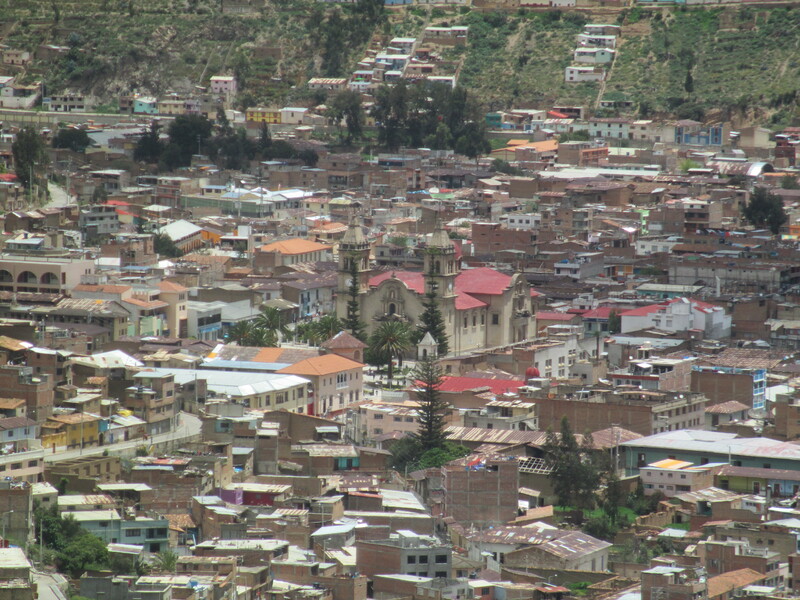 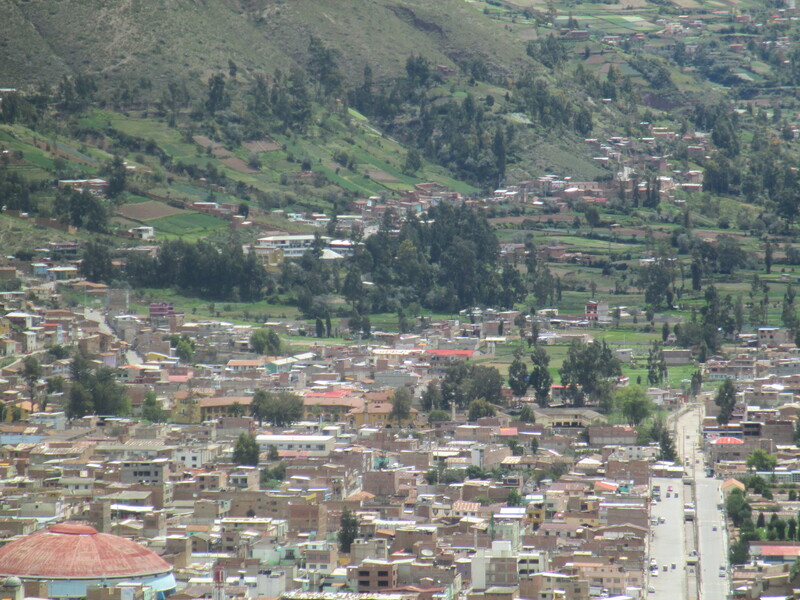 Since all the land near the center of this Andean city was already occupied, the Jesuits purchased property on a steep slope halfway up the mountain. 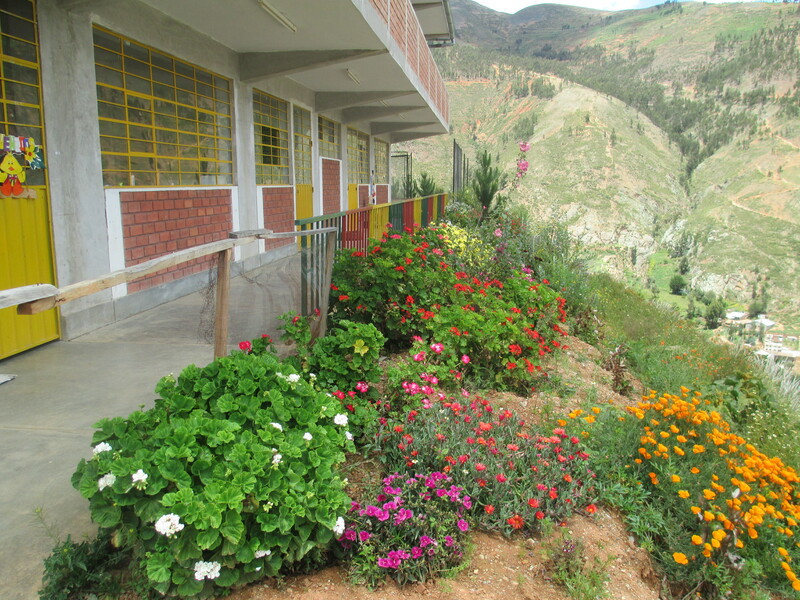 The location works well for several reasons: (1) it is located at the top of the humble neighborhood where most of the students live, (2) it offers a great view of the city below and (3) the teachers and students get plenty of exercise climbing the hundreds of steps up to the school each morning. 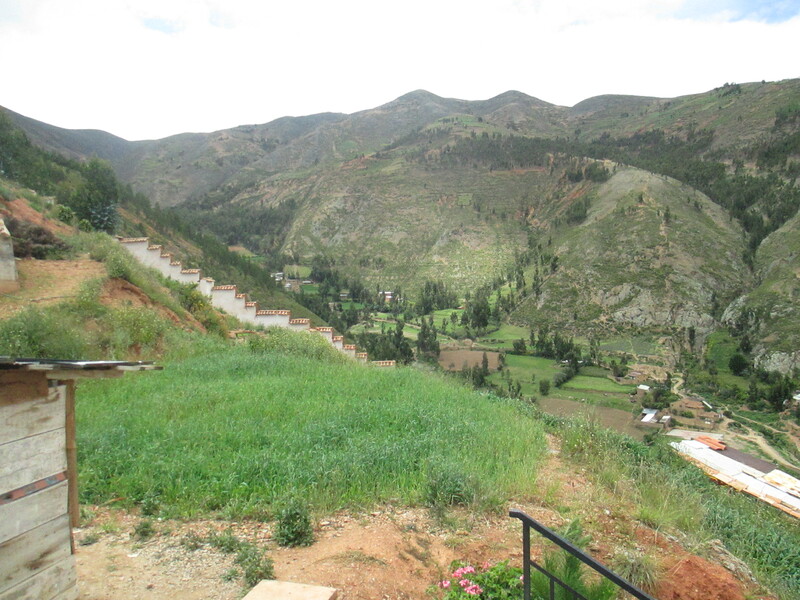 There is, however, a downside — before the buildings could be constructed, tons of earth had to be moved. 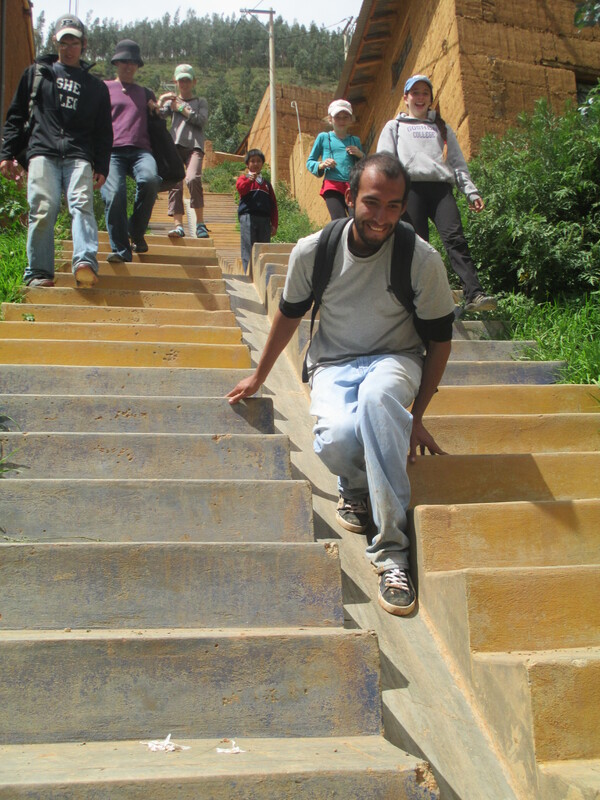 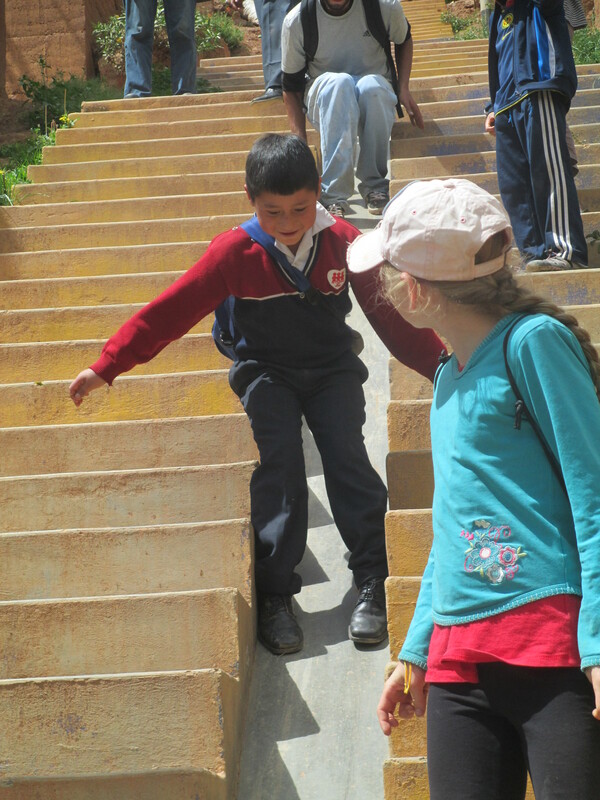 Level places were carved into the steep slope in order to create spaces for classrooms and a playground. 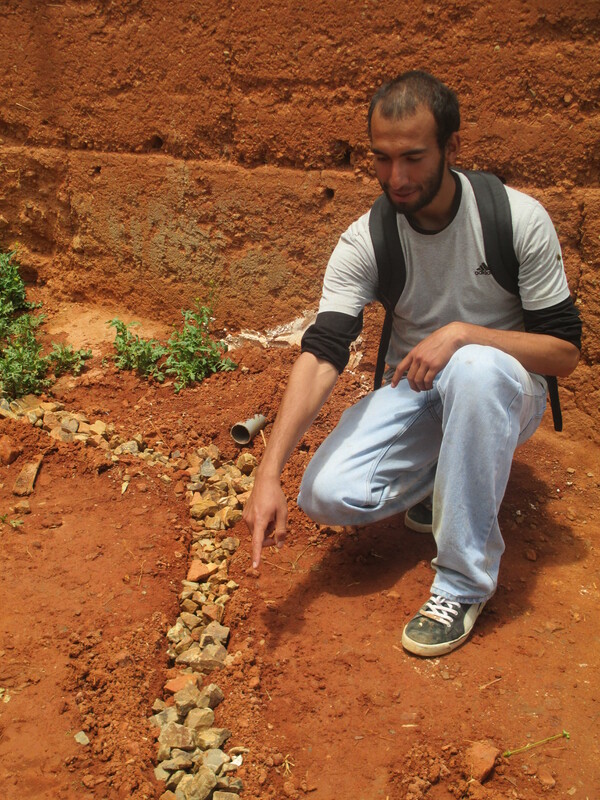 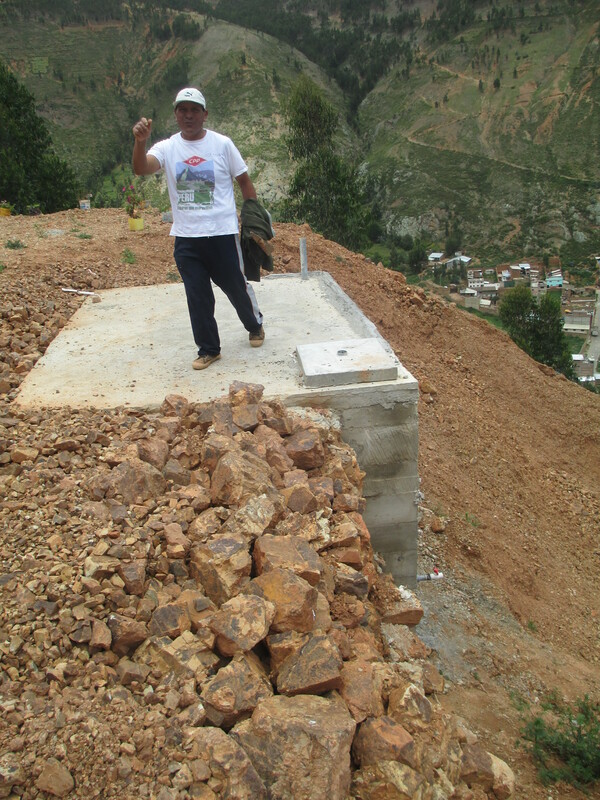 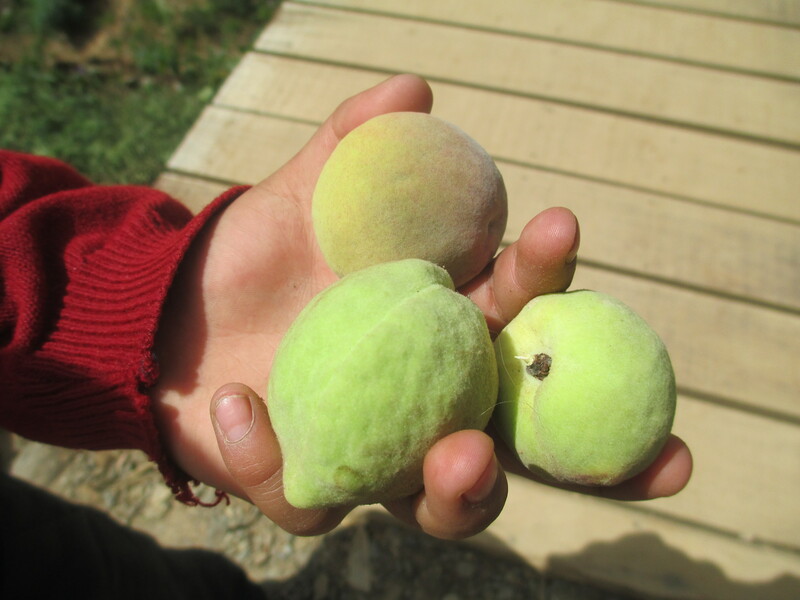 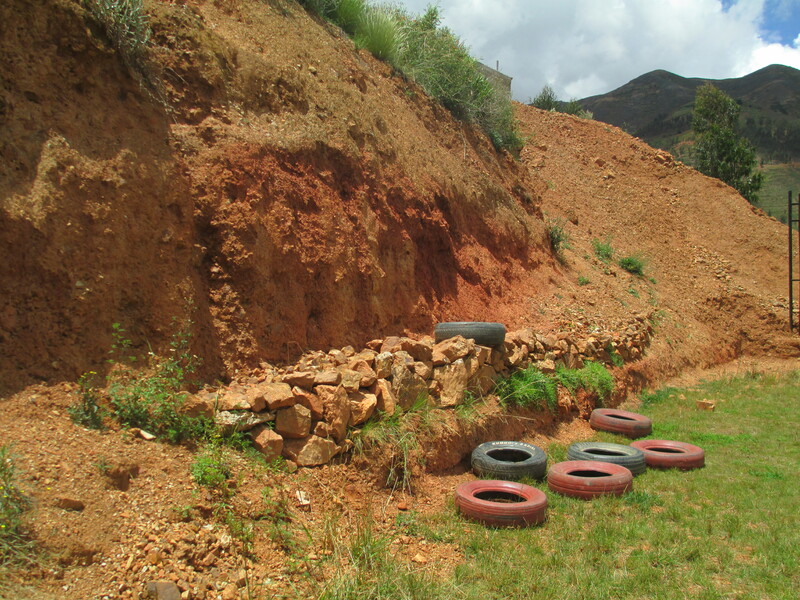 When the summer rains came this year, several landslides occurred on the property. 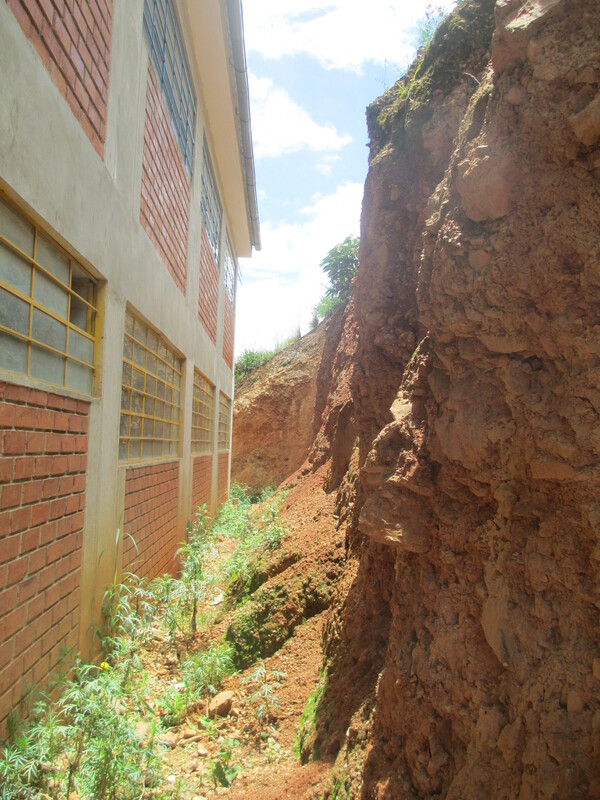 Mud and rocks slipped down the mountain and onto the school grounds, piling up against one of the buildings and creating a muddy mess just before the school year began in early March. 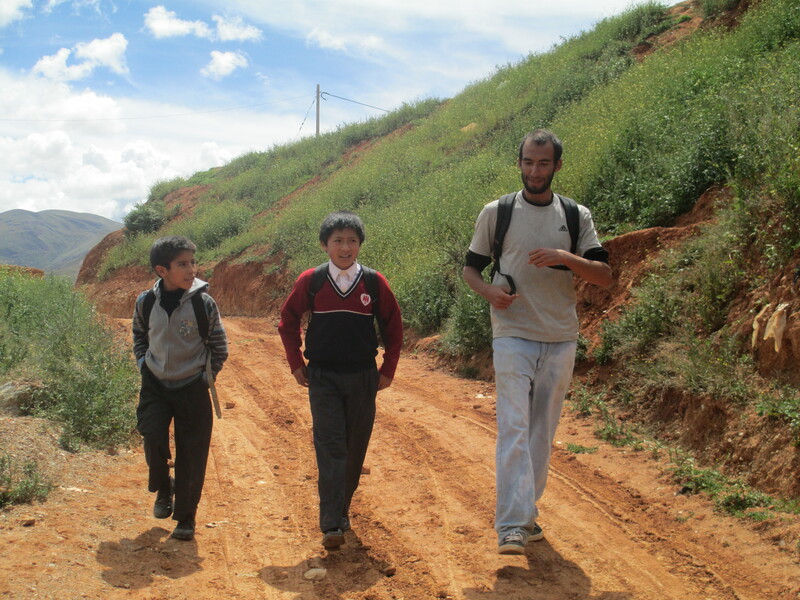 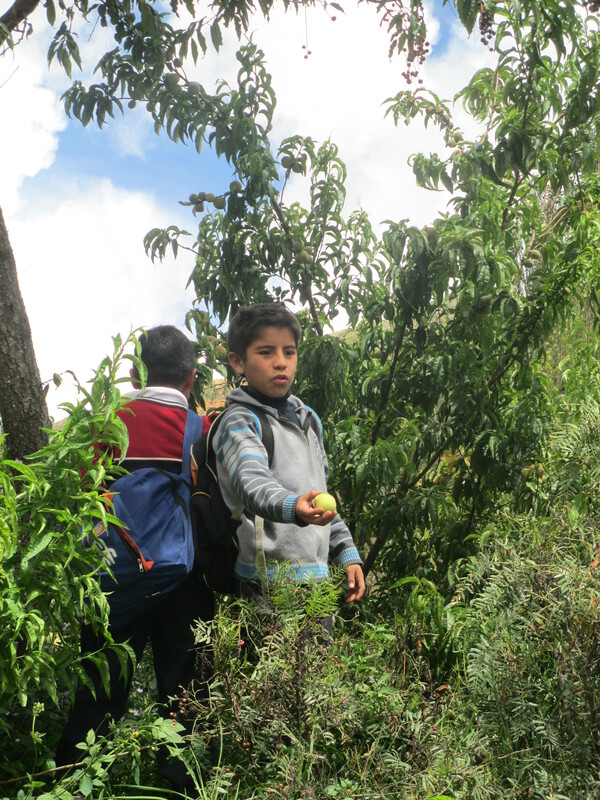 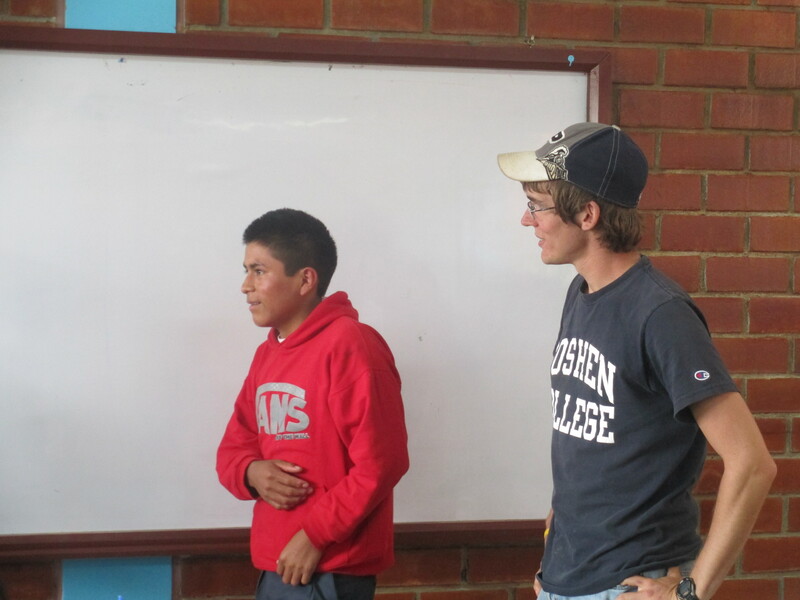 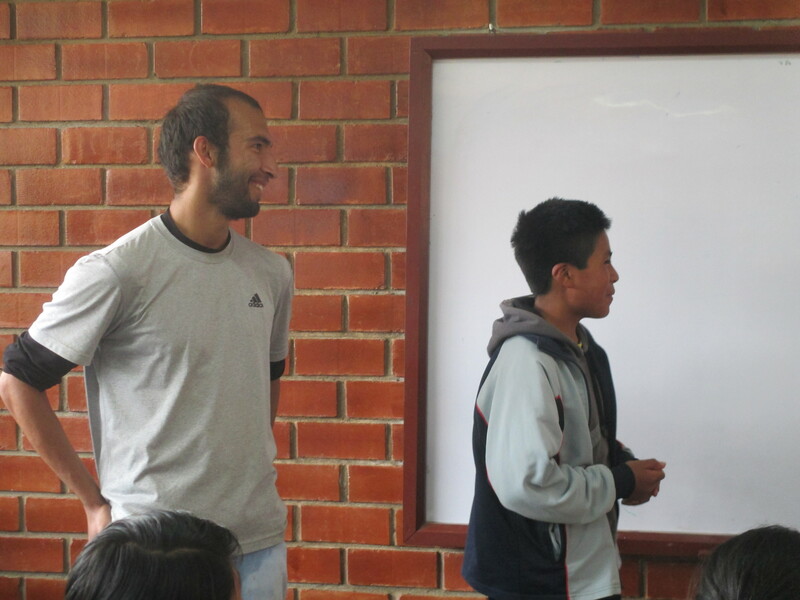 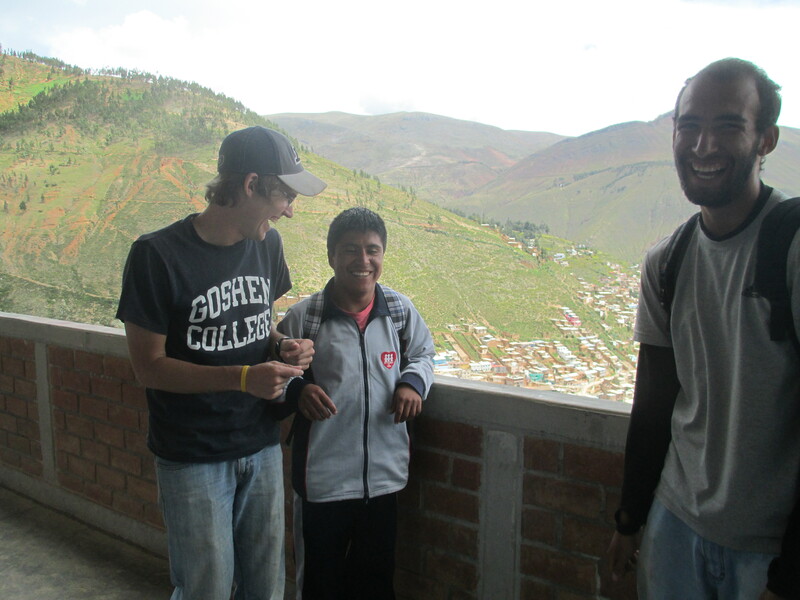 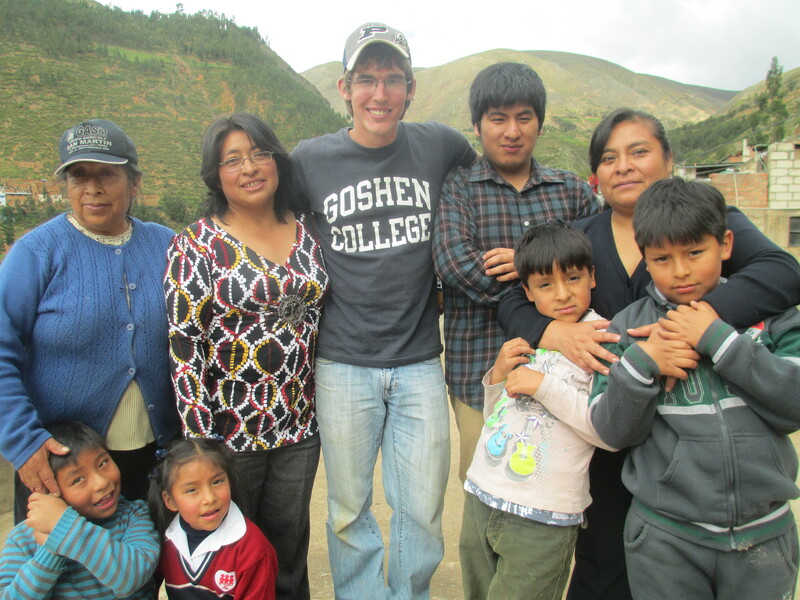 Andrew and Oscar came to Tarma ready to assist in the classroom and on the playground. 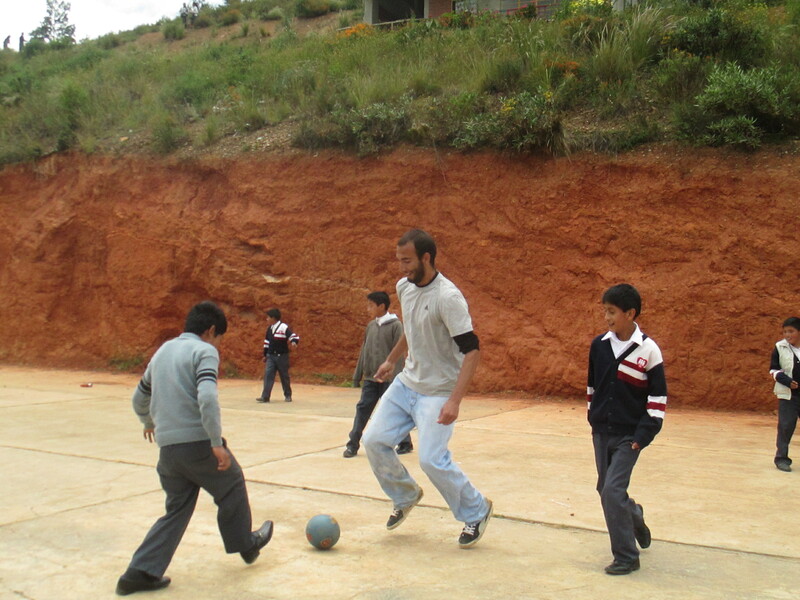 They do this each day, helping with English classes and playing with the children during recess. 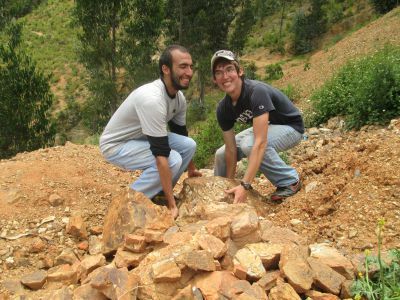 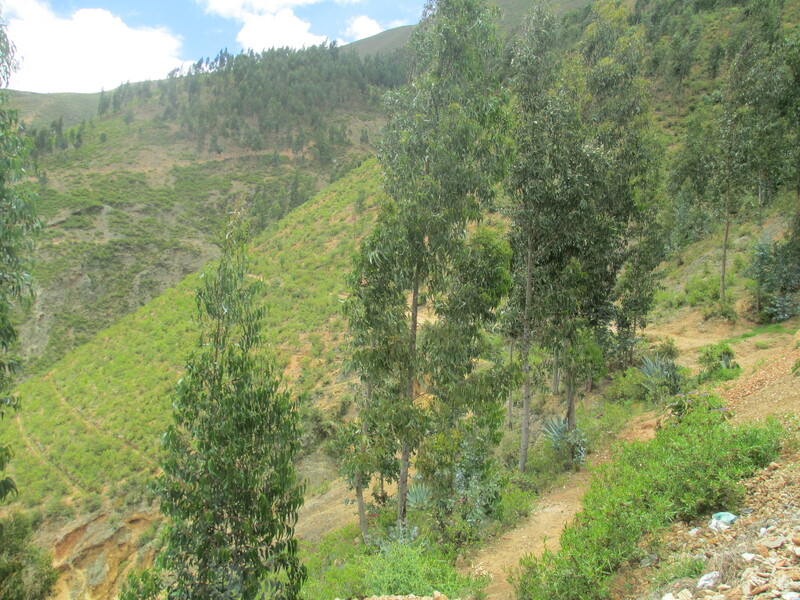 But when their assignment began in mid-February most of their time was devoted to earth moving — one rock, one shovelful, one wheel barrow at a time — to clean up the debris carried down the mountain by the heavy rains. 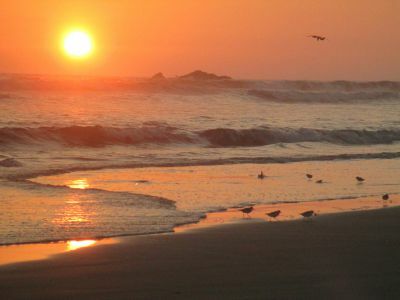 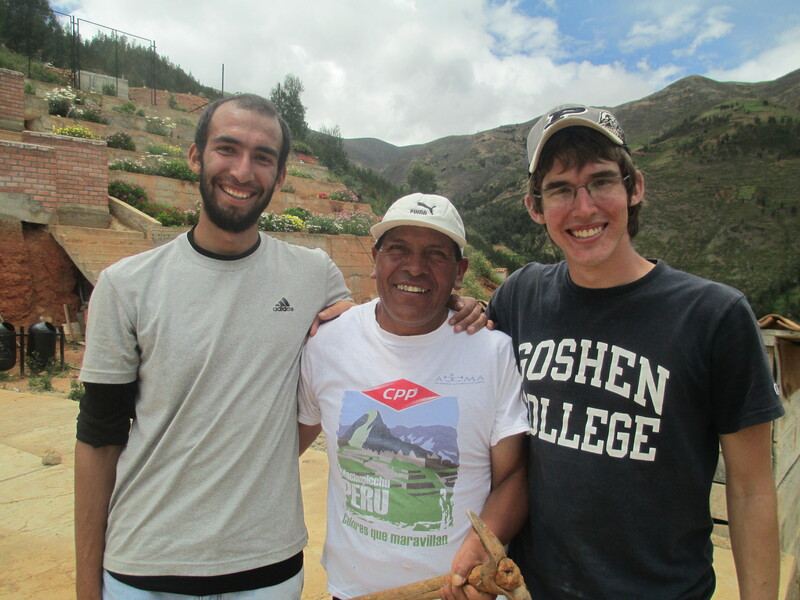 In addition to cleanup, they have assisted Hector, who is responsible for the buildings and grounds, with a variety of construction and maintenance projects. 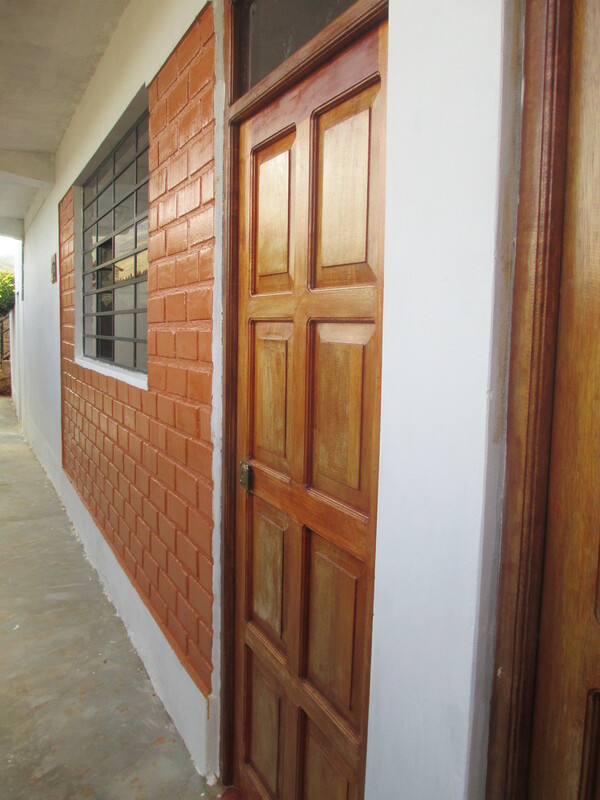 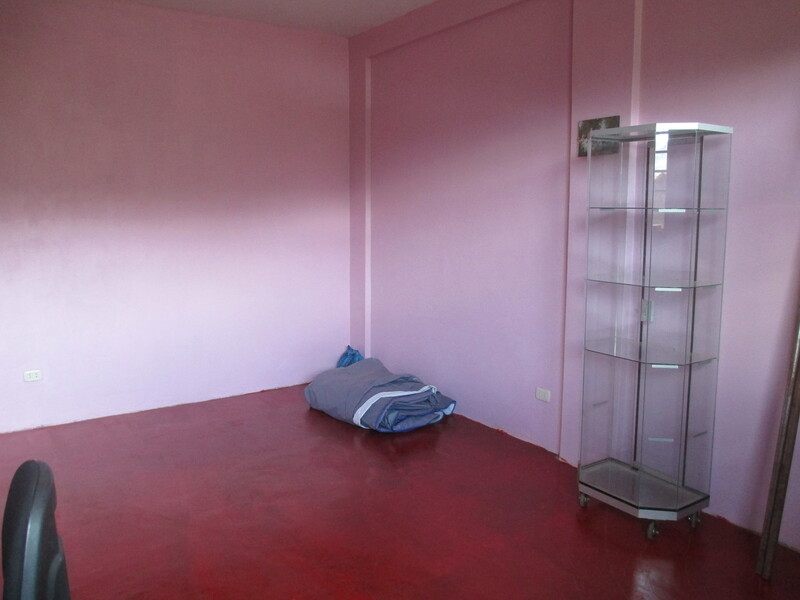 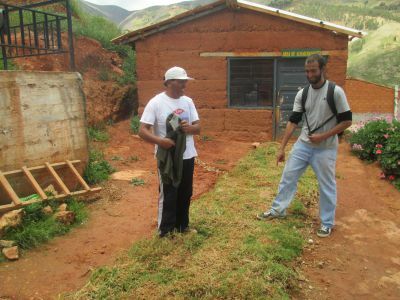 They have built retaining walls, dug channels to divert rain water, replaced glass in broken windows, installed a metal roof, painted several rooms and planted grass in areas that get muddy when it’s wet. 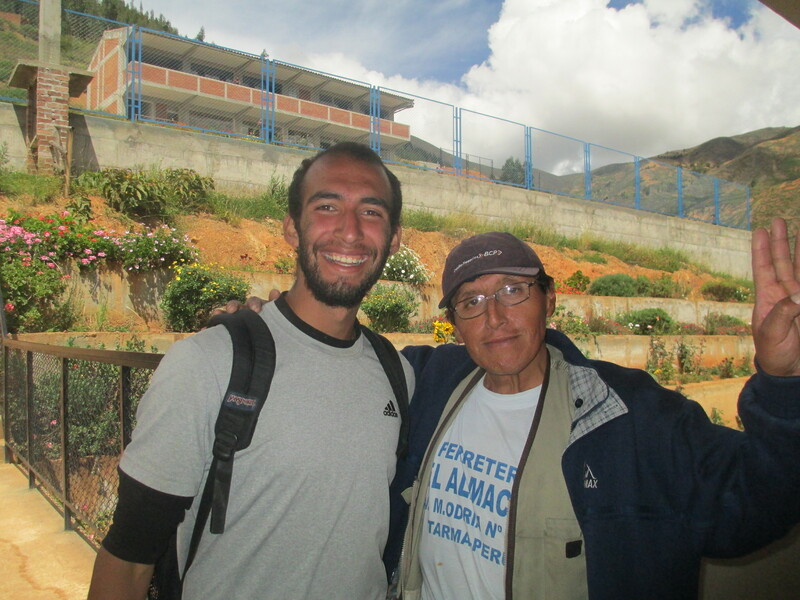 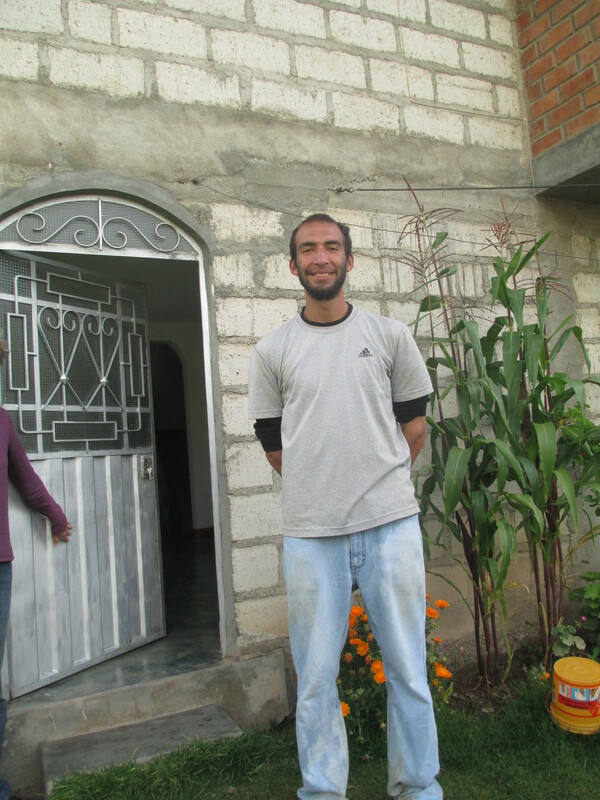 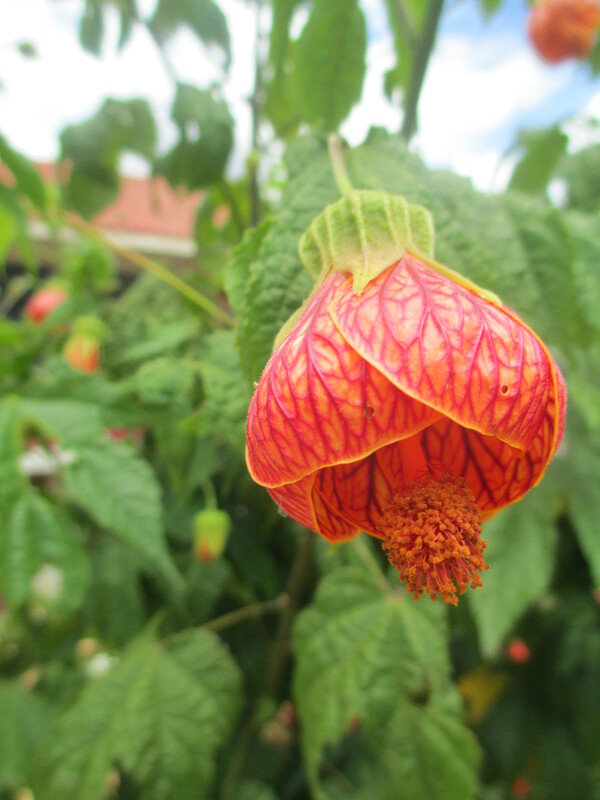 Oscar has focused mostly on outdoor work during his time at Fe y Alegria, while Andrew has spent more time in the classroom. 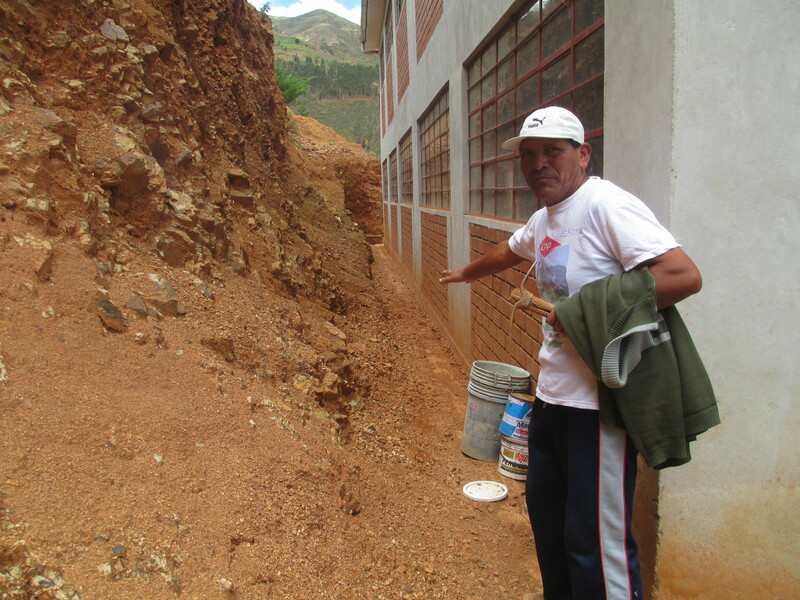 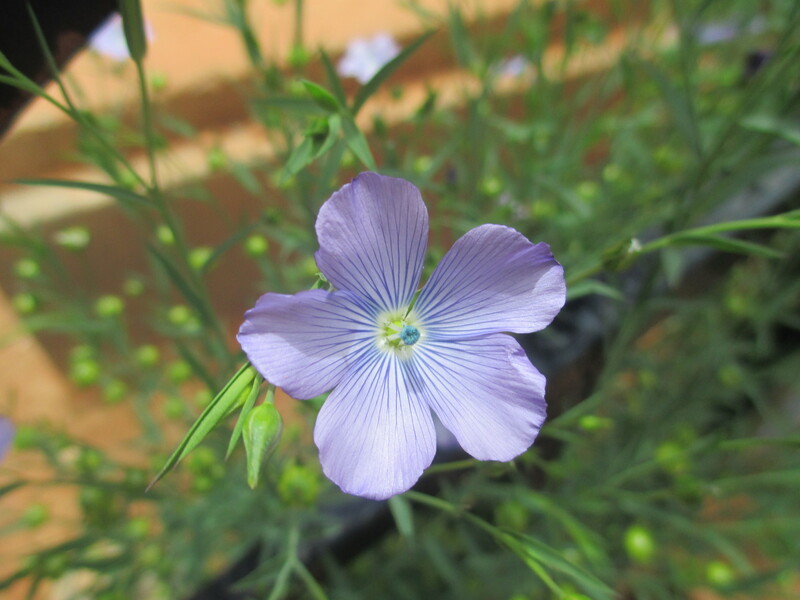 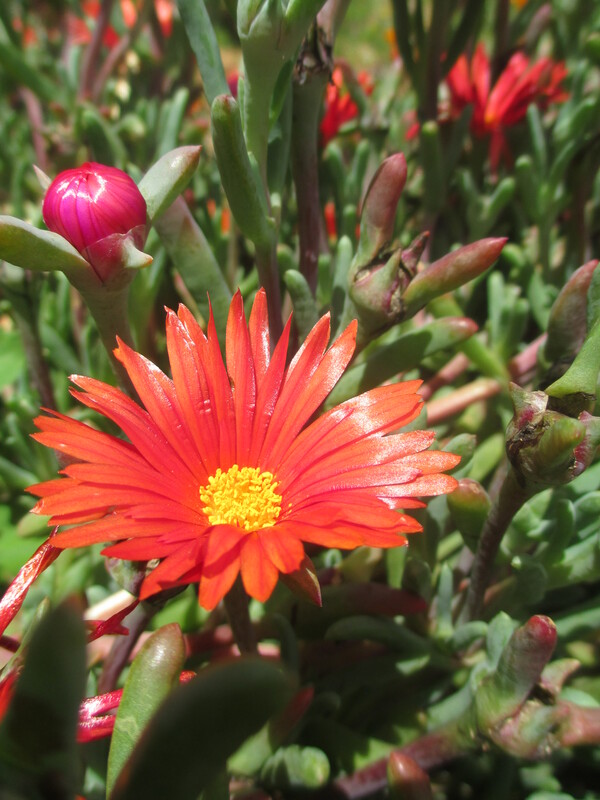 Oscar is keen to leave his mark on landscaping projects, like a rain water channel and newly-planted grassy areas, that will prevent damage when the heavy rains return next summer. 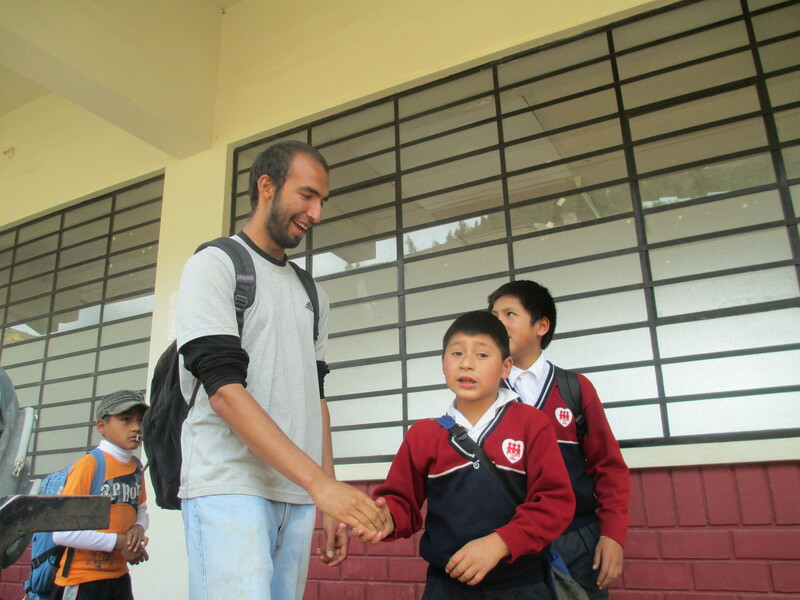 His cheerful attitude, and willingness to help Hector take on projects that could not be done alone, are greatly appreciated by school staff. 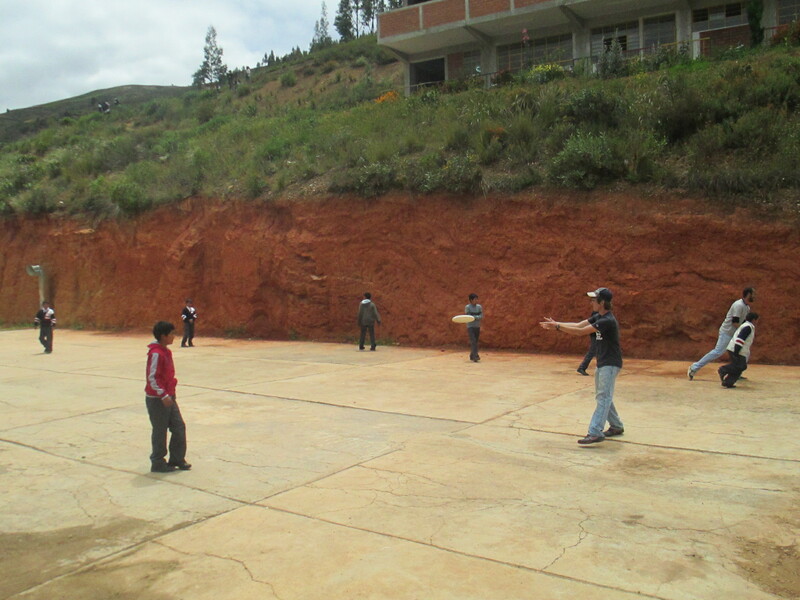 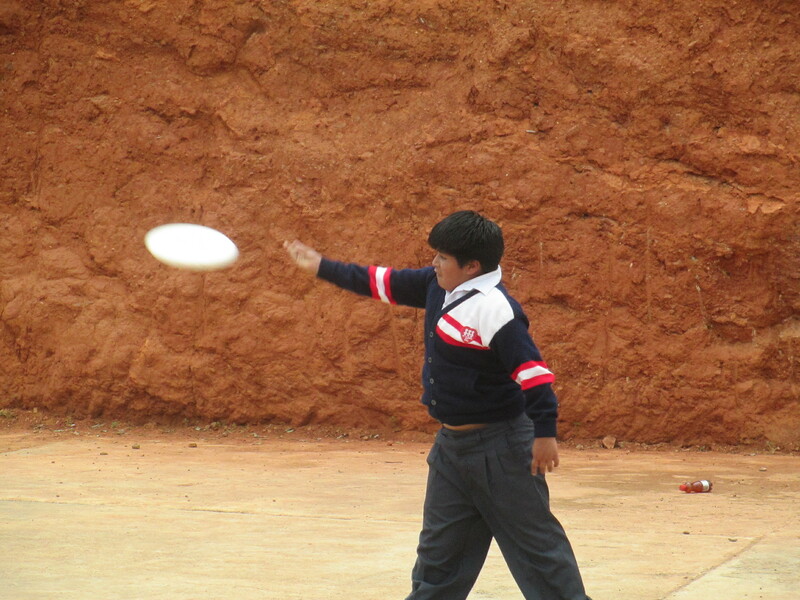 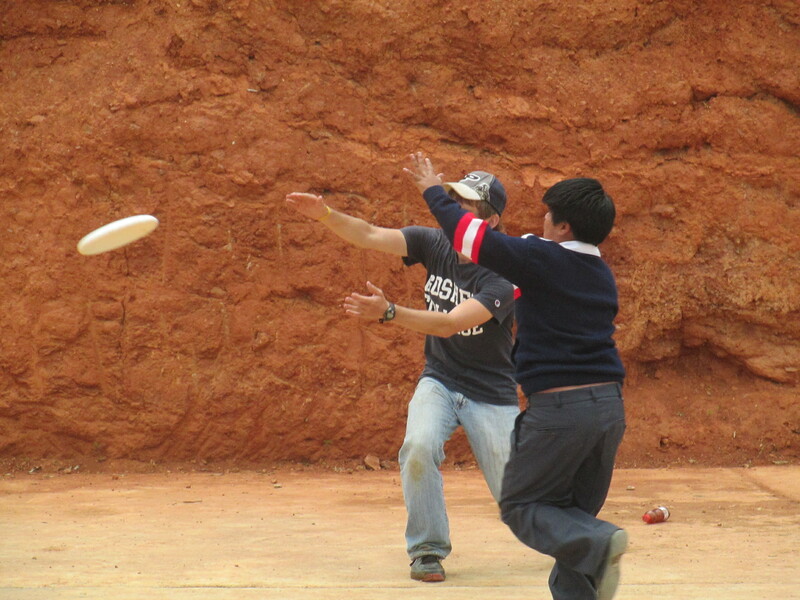 And when it’s time for recess, Oscar gladly joins in on the daily game of Peru’s national sport, soccer. 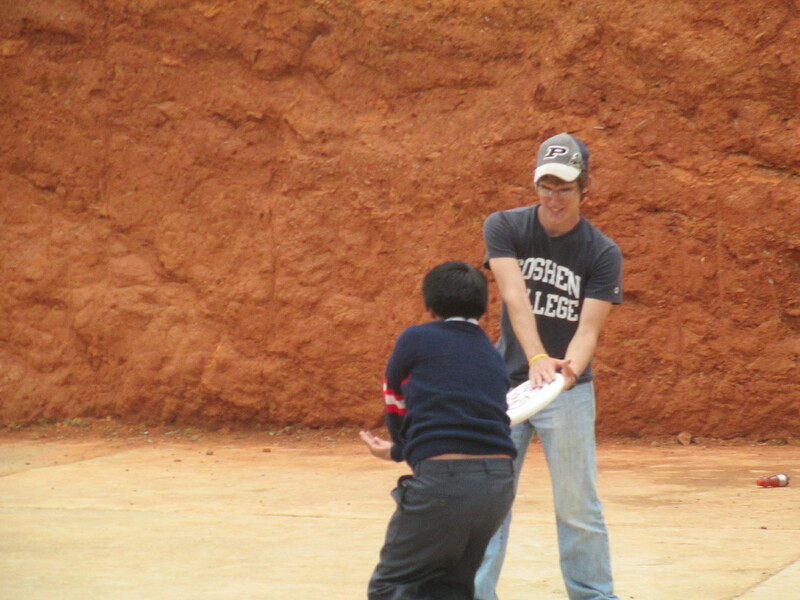 Andrew, meanwhile, teaches the children how to throw and catch a disco (frisbee) when recess comes, an entirely new activity that fascinates many of the boys. 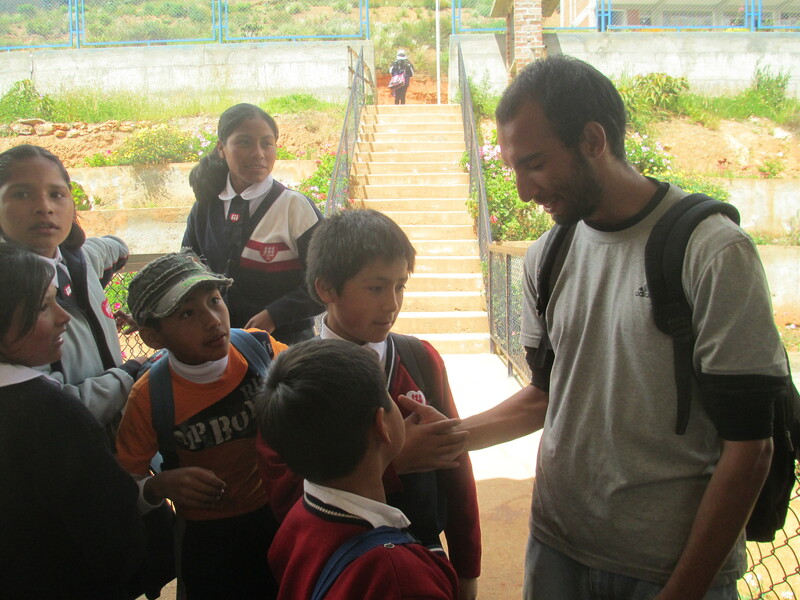 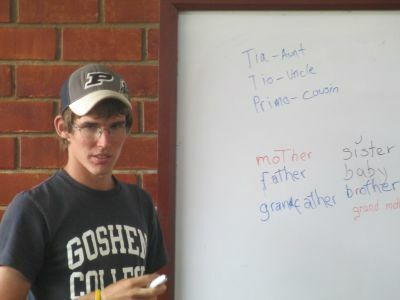 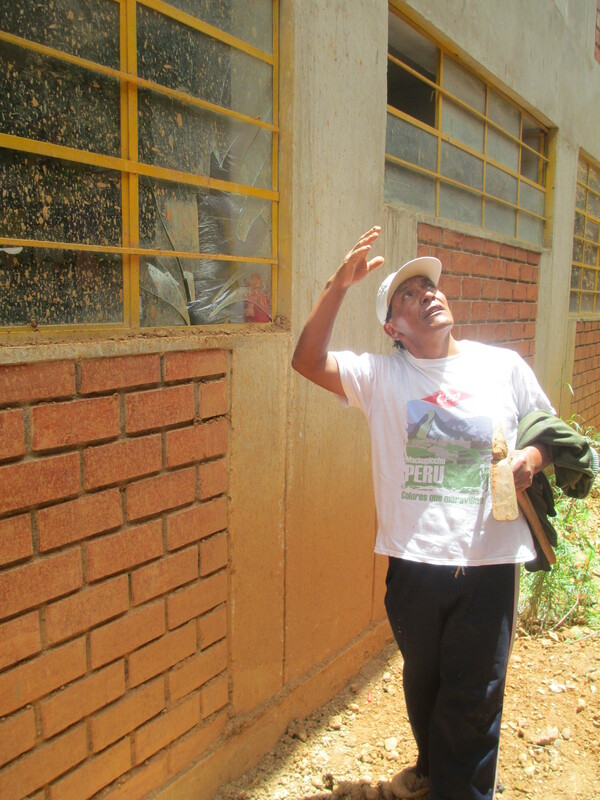 He also enjoys interacting with children in the classroom — on the day we visited he realized that the teacher was absent from one of the classrooms and immediately volunteered to teach the restless students some new English vocabulary, the names for the members of their extended families (e.g. 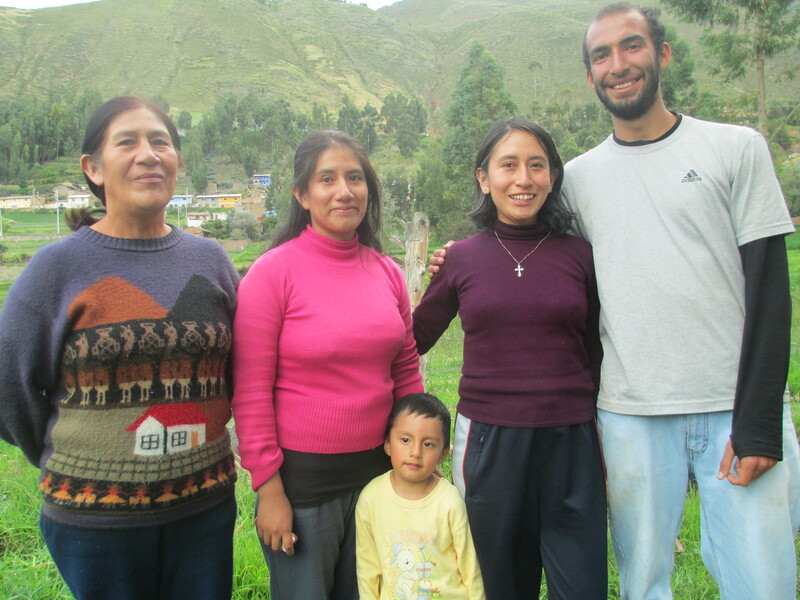 aunt, uncle, cousin, etc.). 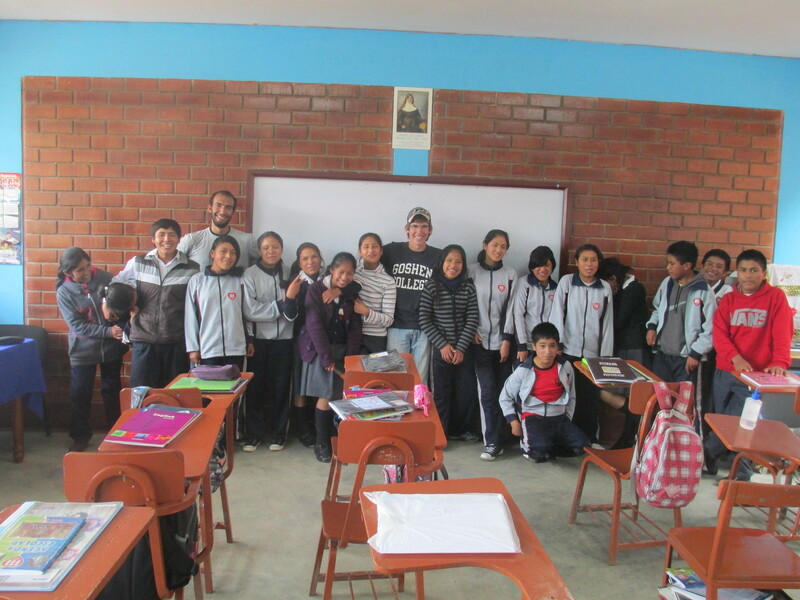 Andrew’s willingness to engage the students and inside and outside the classroom has contributed to their learning, and his outgoing personality has helped him make friends with the teachers as well. 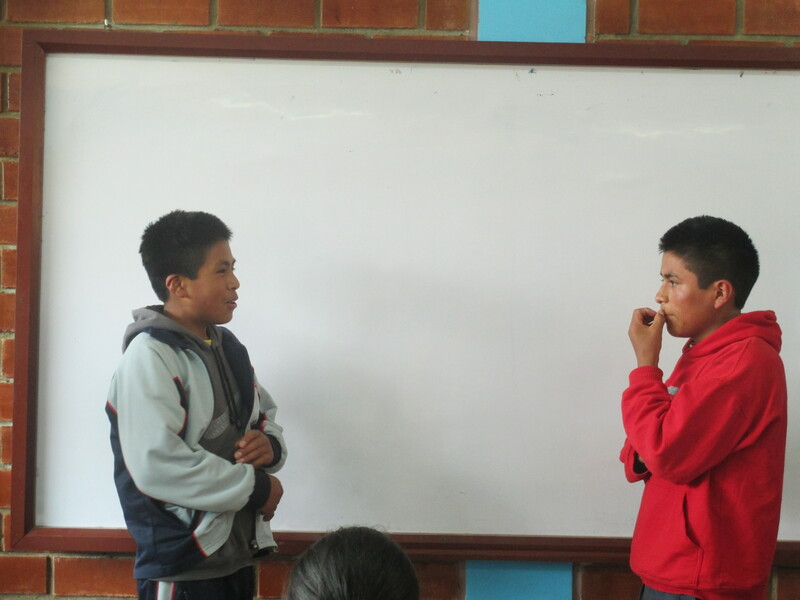 Together, Oscar and Andrew have had ample opportunities to share their knowledge, their kindness and their undivided attention with the students, teachers and staff at this well-run school. 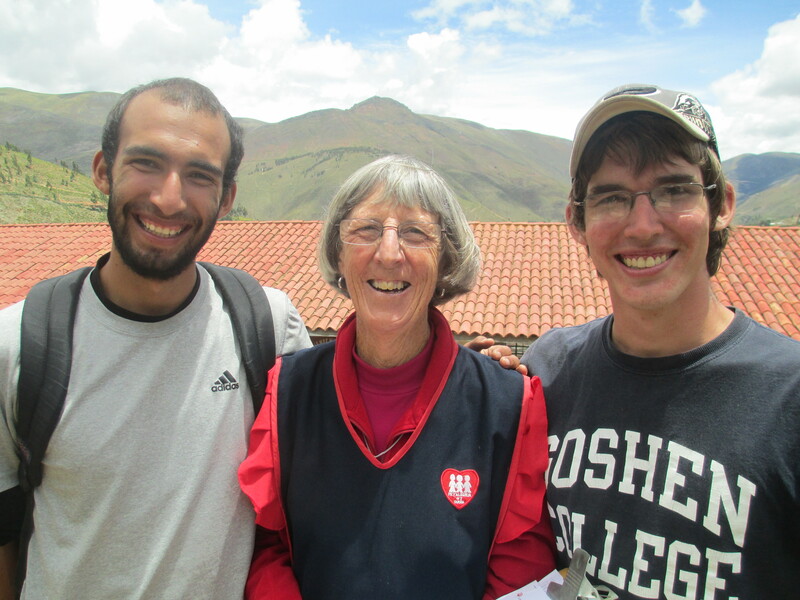 They were there when it was time to celebrate the announcement of the new Pope with an all-school Pachamanca picnic — Pope Francis is a Jesuit and the first pope from Latin America. 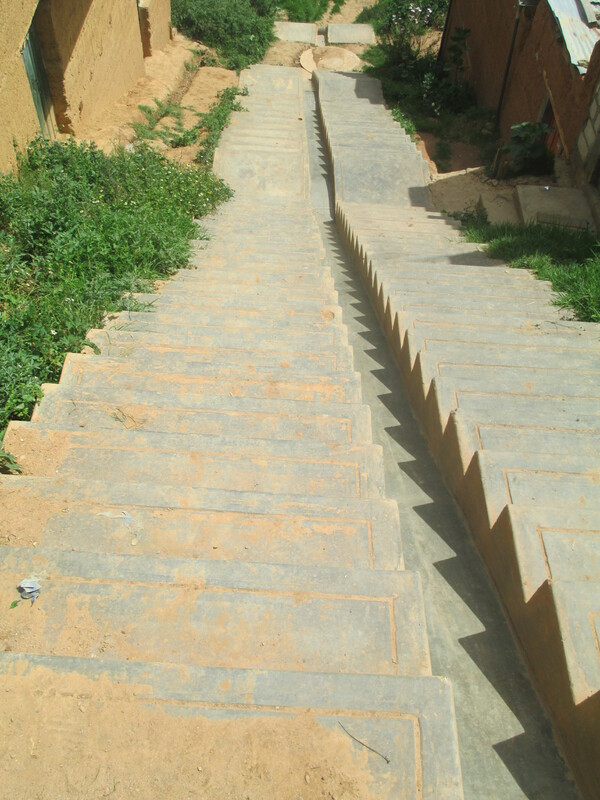 And, as it turned out, they have also had a chance to get a good work-out while here, not just climbing all those steps to get up the hill in the morning but also using their hands, arms and backs to make the school grounds safe and accessible for the students who study here each day.